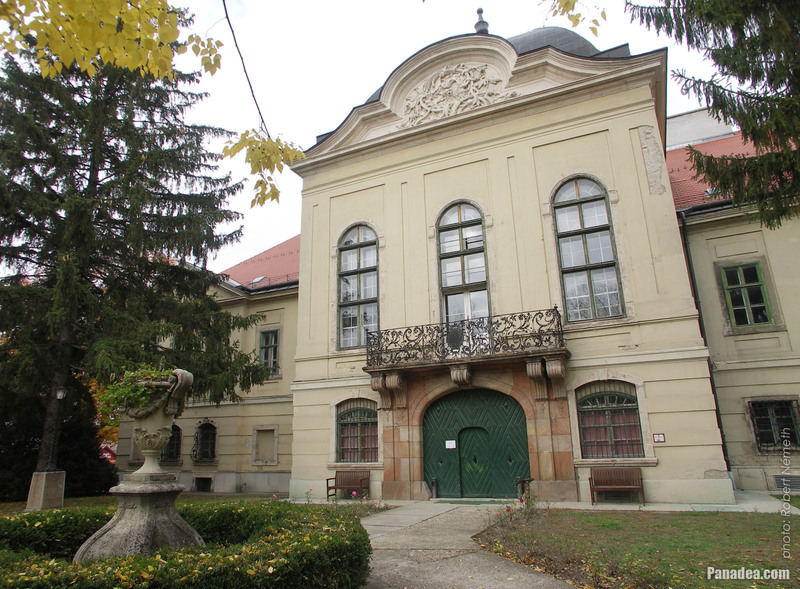 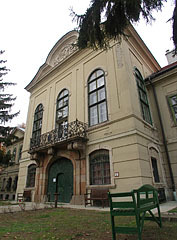 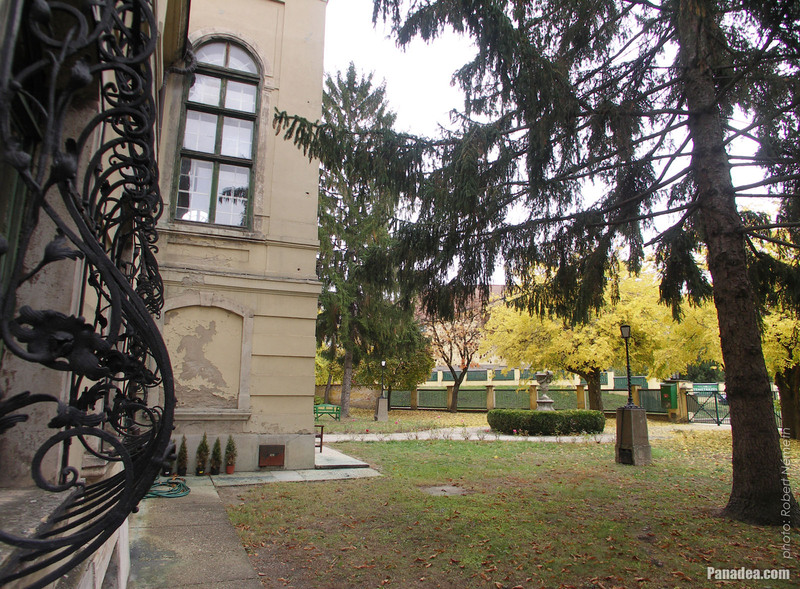 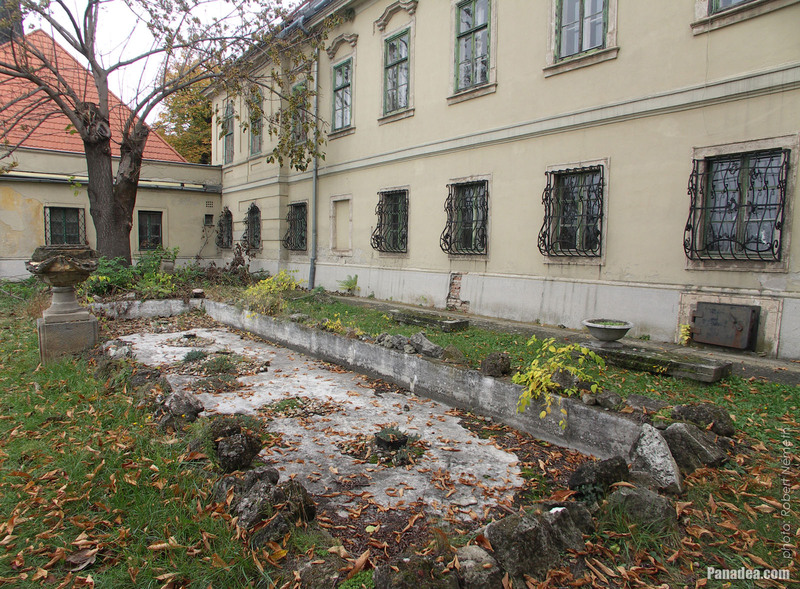 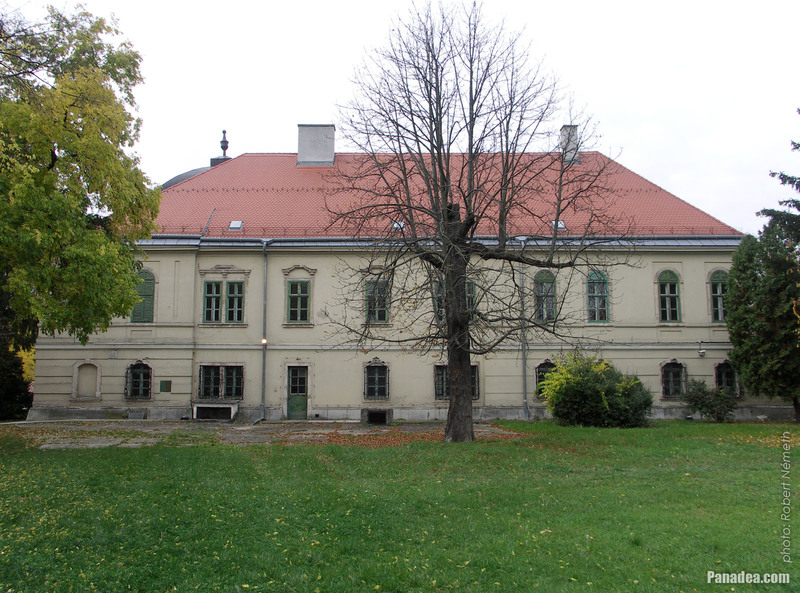 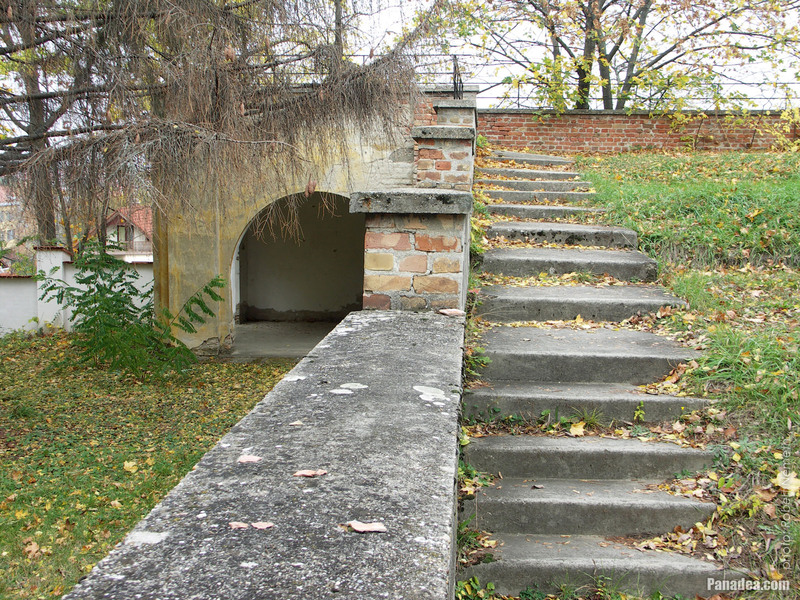 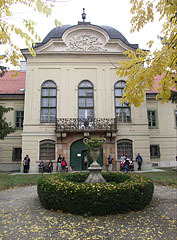 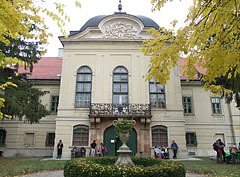 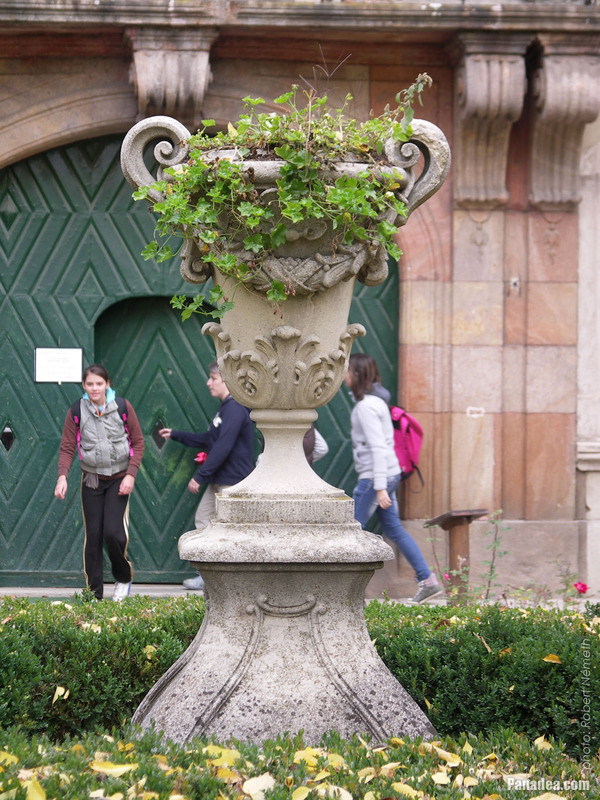 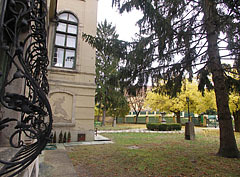 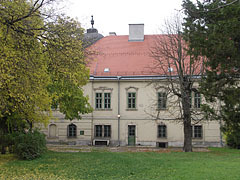 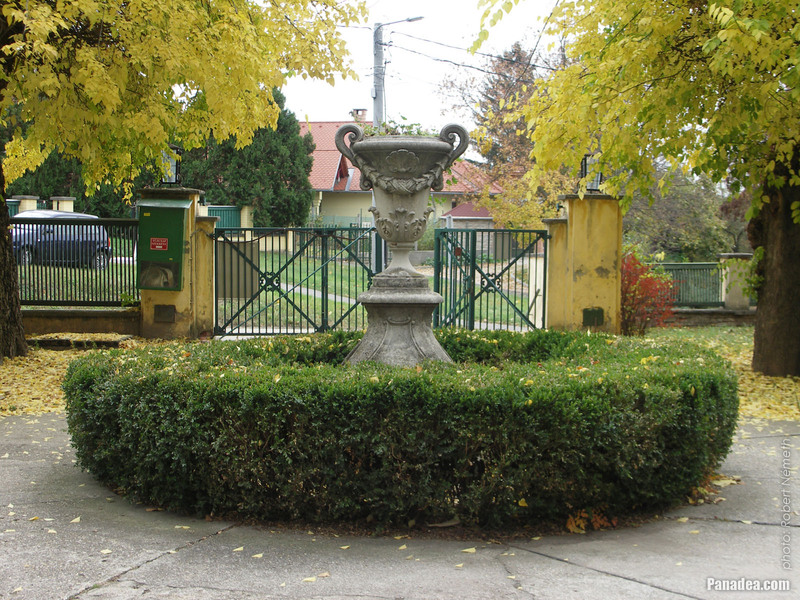 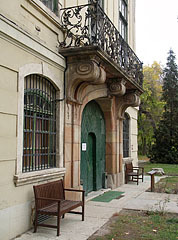 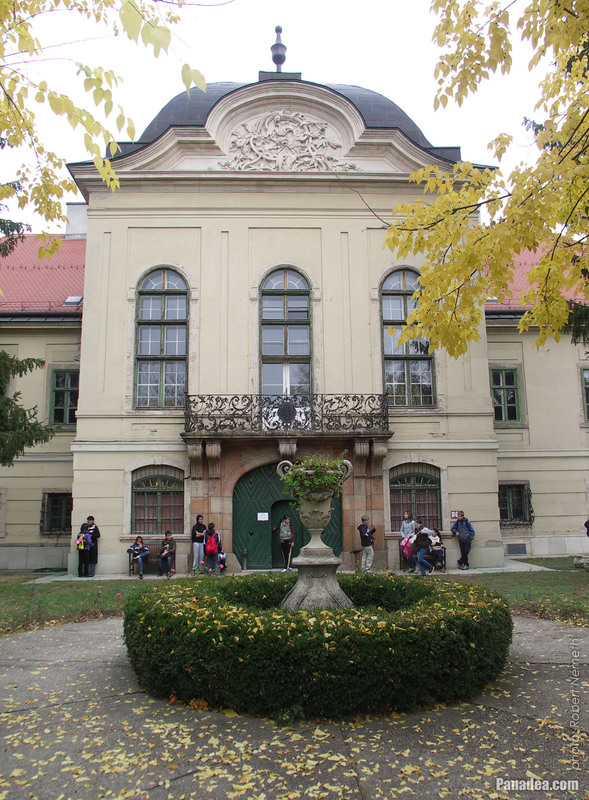 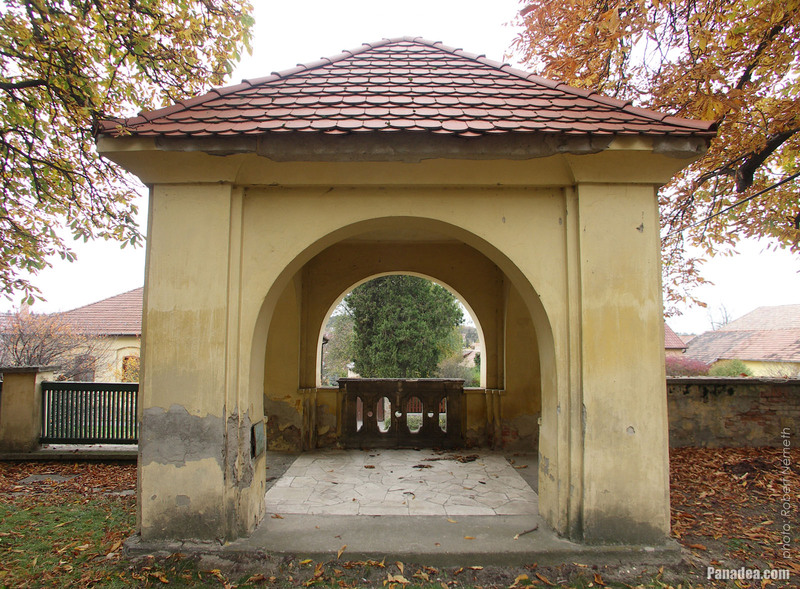 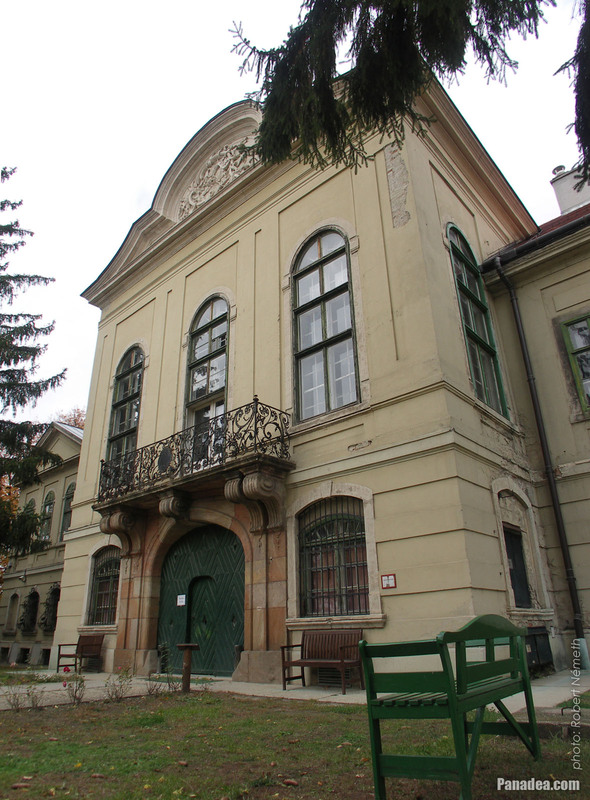 The building is quite similar to the Grassalkovich Palace of Gödöllő also because it was designed by the same architect: Andreas Mayerhoffer. 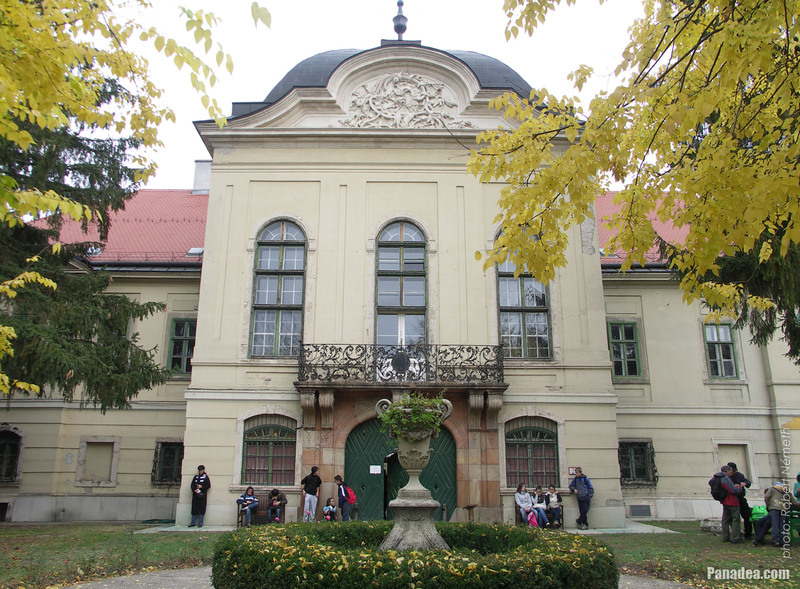 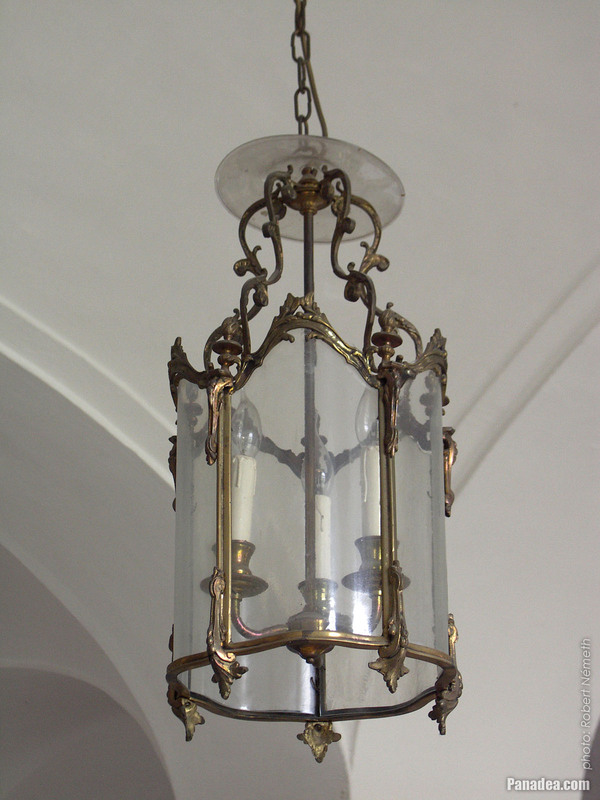 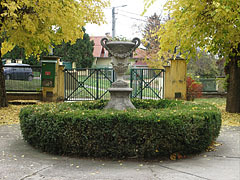 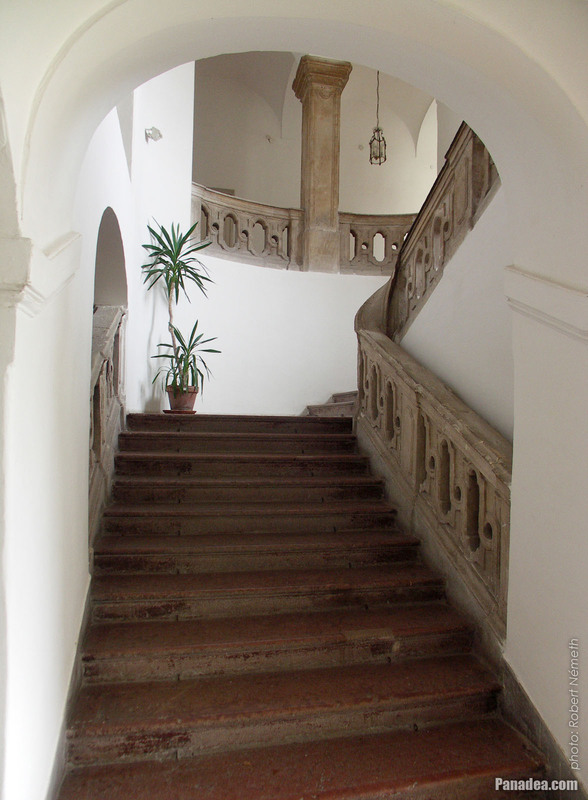 It was built in two phases between 1722 and 1770, architects: András Mayerhoffer and his son János, from Salzburg. 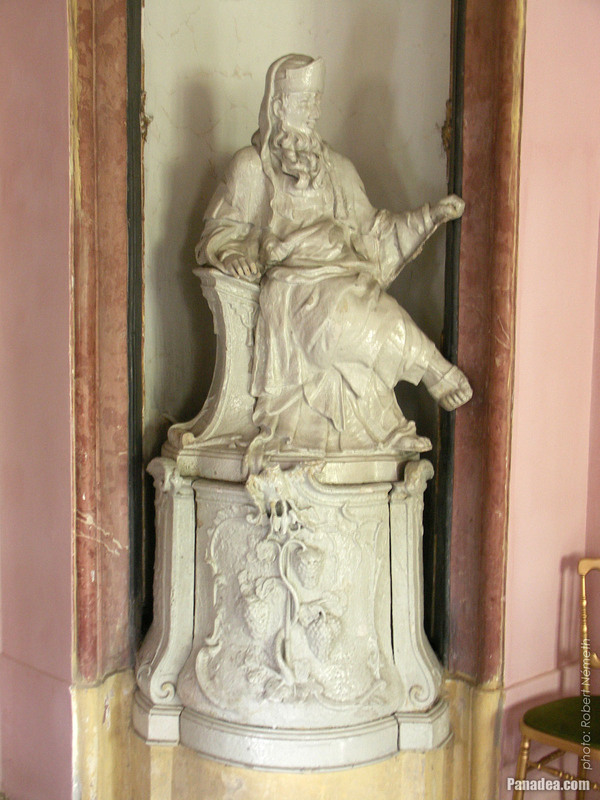 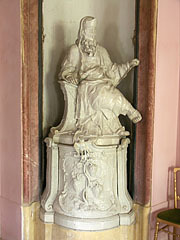 The statue on its top is a subject of debates: it represents either Voltaire or Moses. 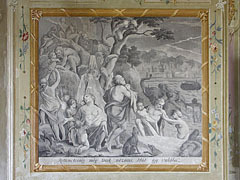 Inspired by the Deucalion flood myth, when Zeus wants to destroy the mankind. 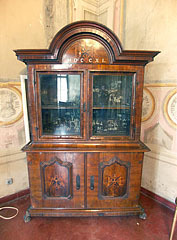 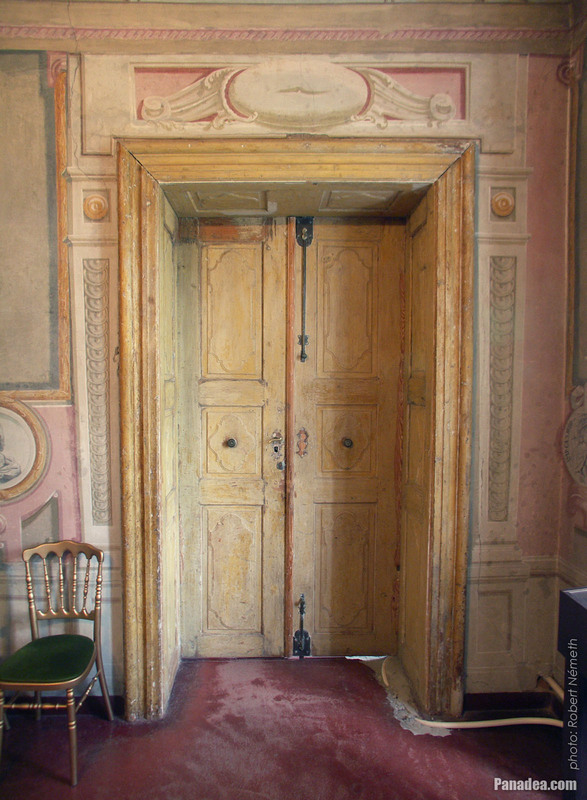 The entirely preserved original door of the "King's Saloon"
An escritoire (secretary desk or writing desk) in the "King's Saloon"
A lady (actually a mannequin doll) in authentic clothes in the "King's Saloon"
The "King's Saloon" or "Billiard Saloon"
After the period when the mansion was MÁV Hospital only this door remained intact, the one between the "King's Saloon" and the "King's Bedroom"
Beautiful old cabinet in the "King's Bedroom"
Wall paintings in the "King's Bedroom"
Authentic copies of old coins in the "King's Bedroom"
And there are some coin paintings on the wall as well. Phaeton begs his father Helios (the god of the Sun) to let him drive the sun chariot. 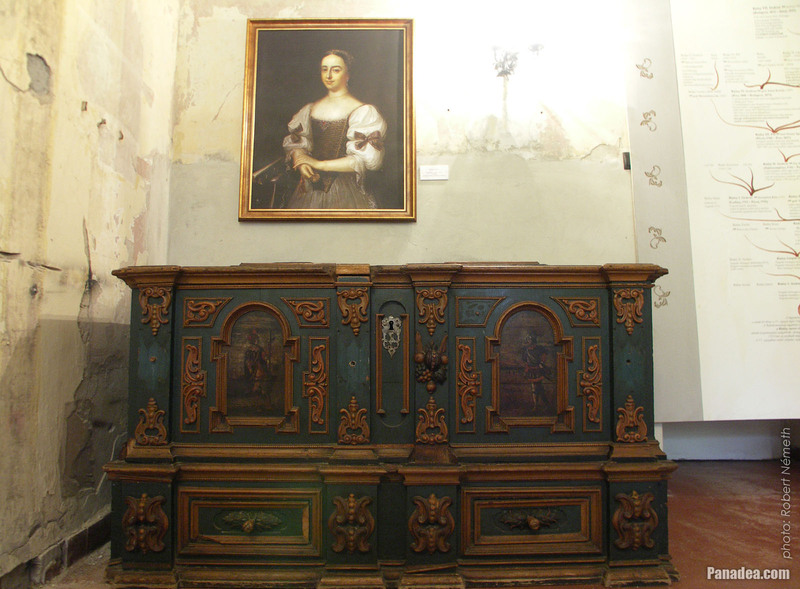 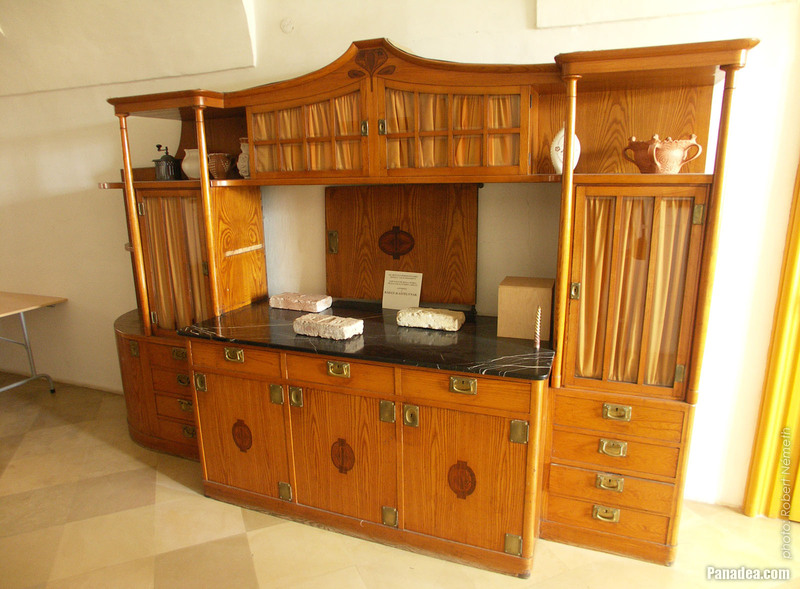 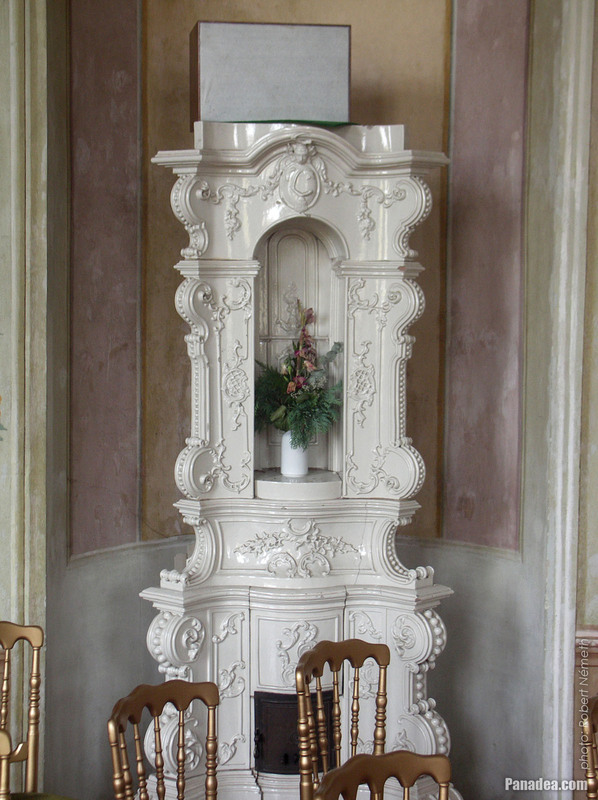 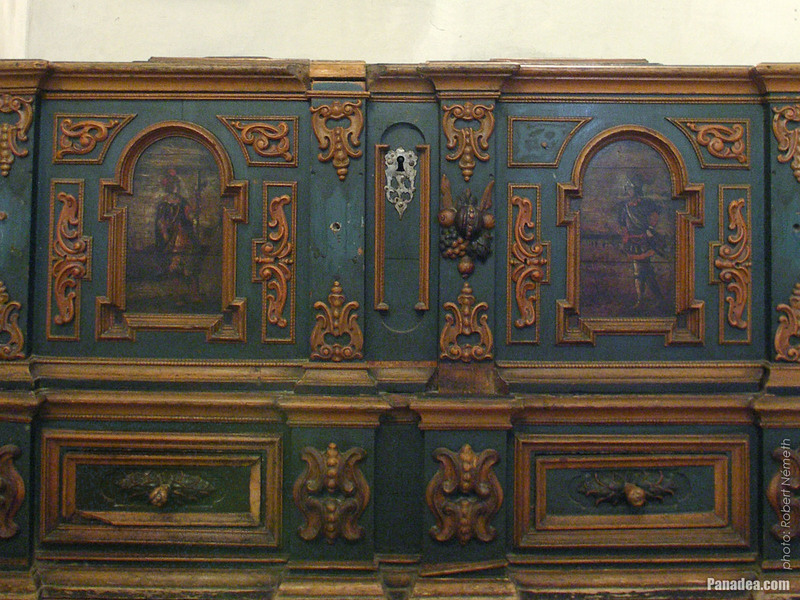 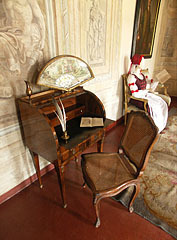 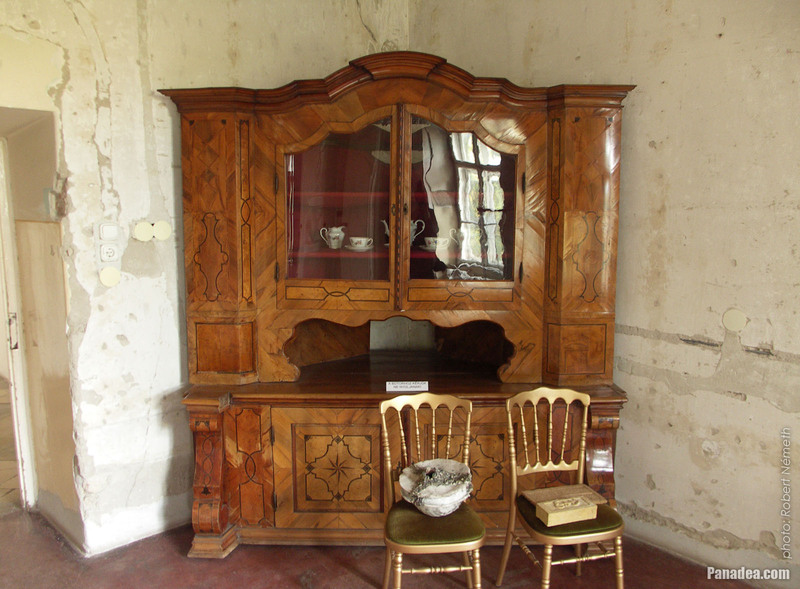 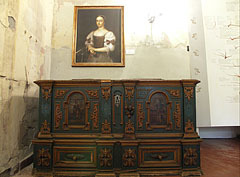 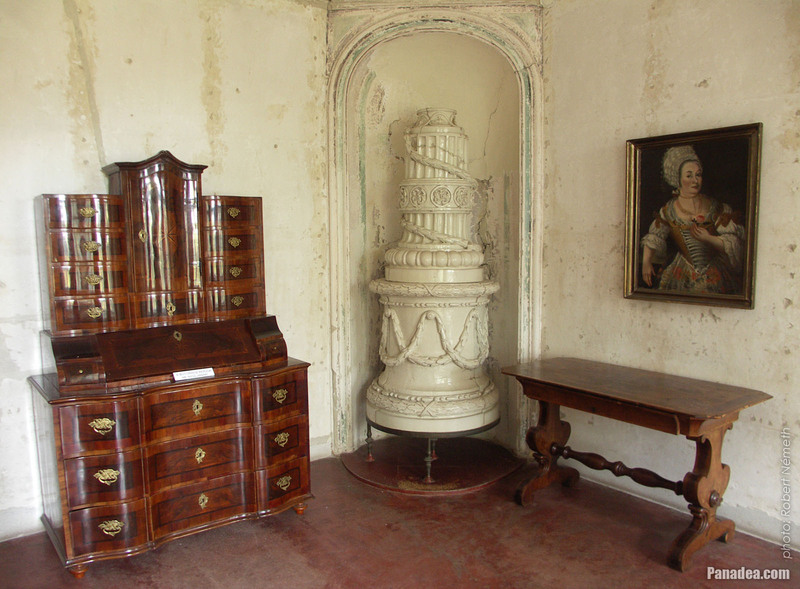 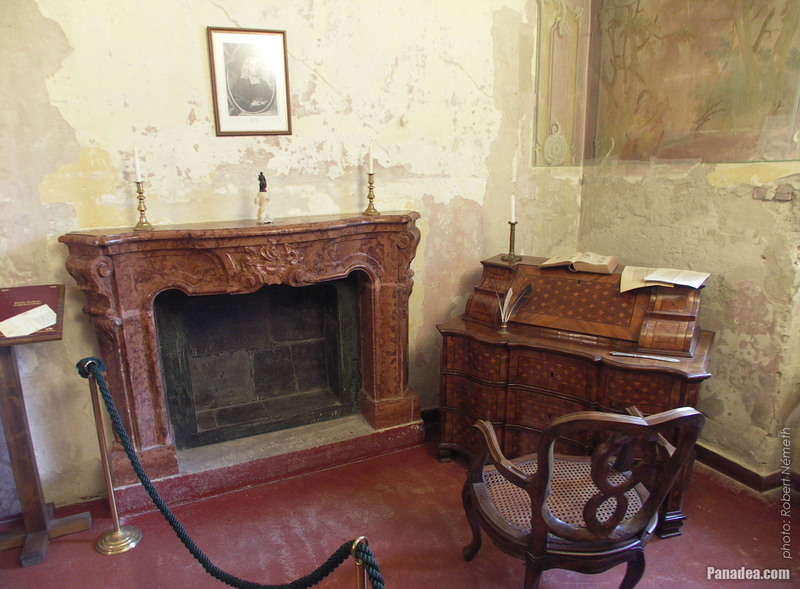 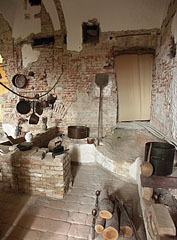 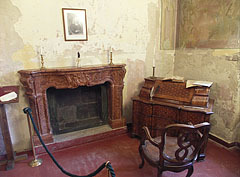 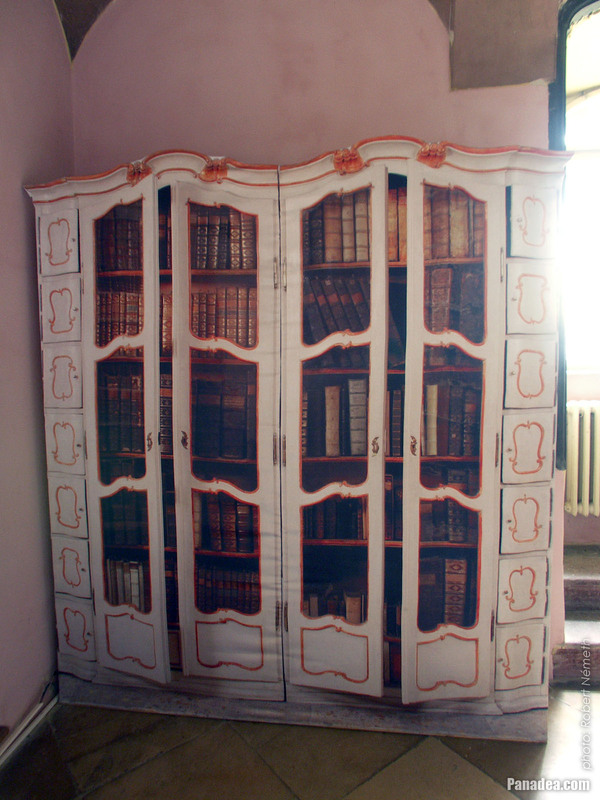 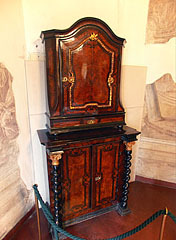 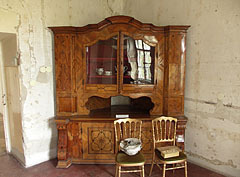 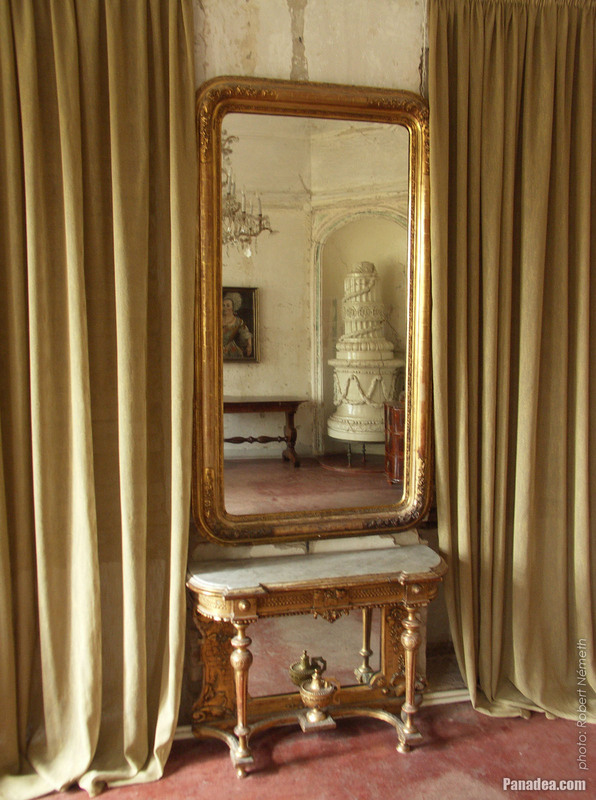 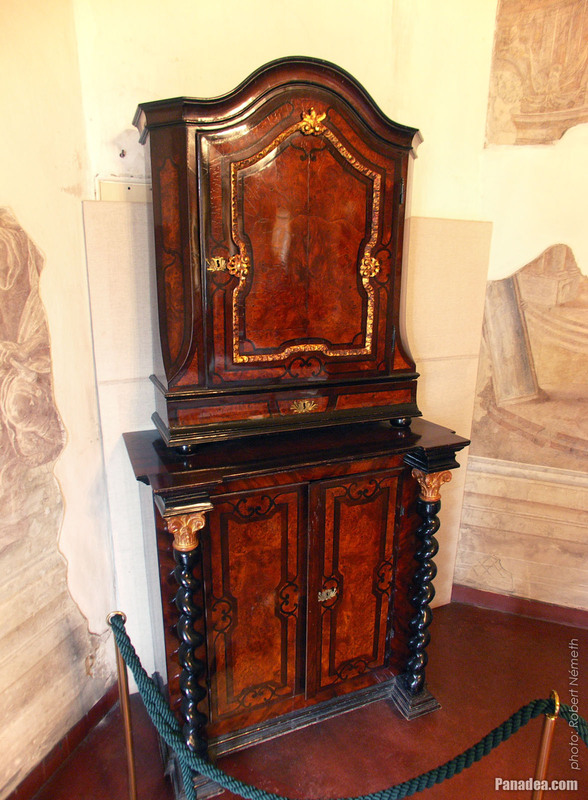 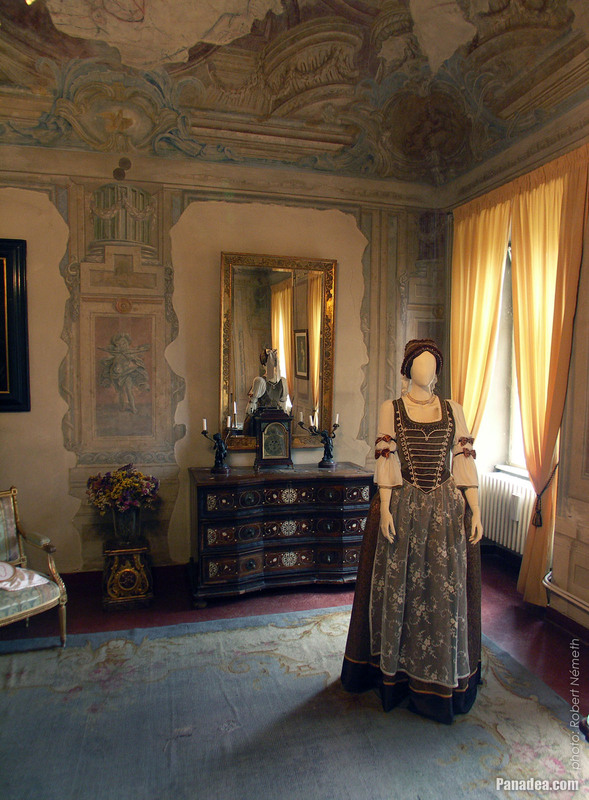 A nice white stove in the "queen's bedroom"
Furniture in the "queen's bedroom"
A cabinet and a stove in the "Queen's Saloon"
A mirror in the so-called "Queen's Saloon"
A "3D" picture in the "Guestroom": "The first encounter of Ferenc Kazinczy and Károly Kisfaludy"
It was created based on the painting of Some Orlai Petrich from 1859. 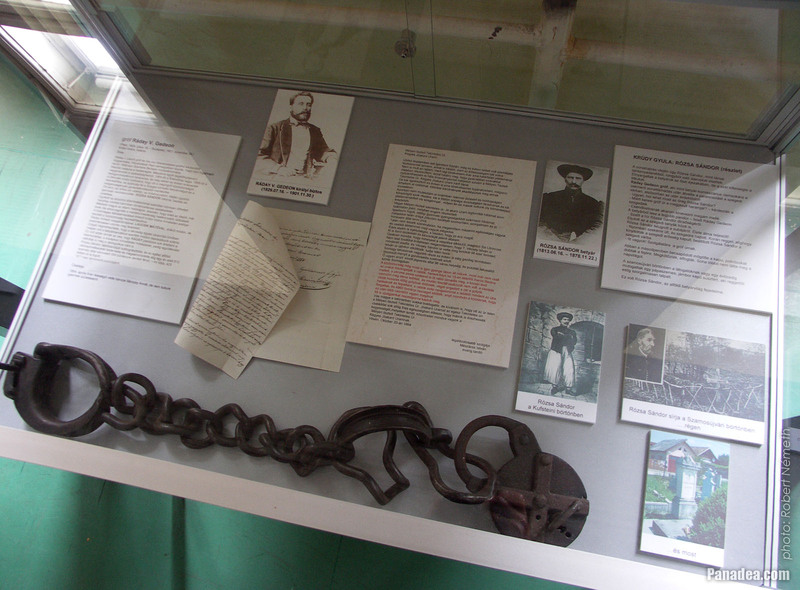 Gedeon Ráday was a Royal Commissioner and he had this criminal person arrested in 1869. All murals were painted over when a hospital was operated here, the recovery is in progress. 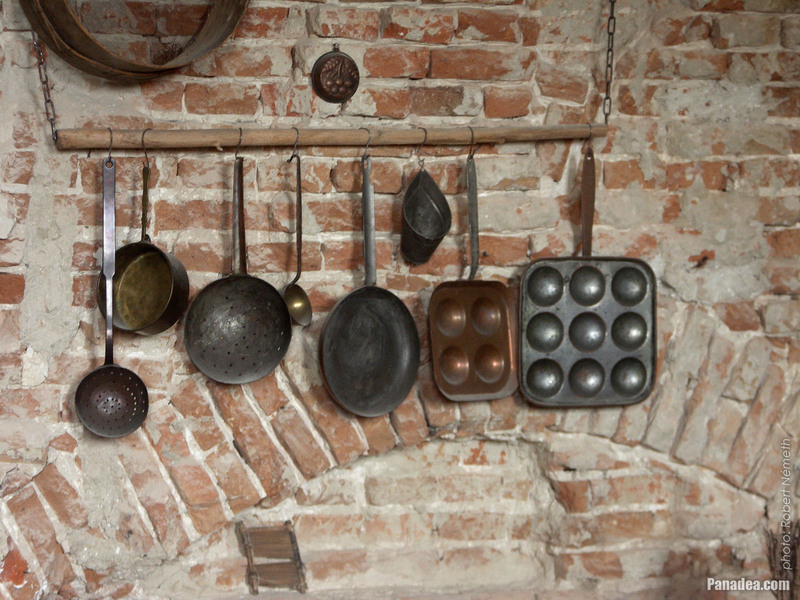 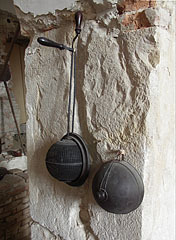 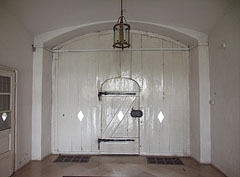 Formerly the staff carried out the completed dish through the doorway that is ahead. 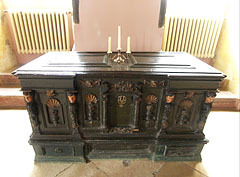 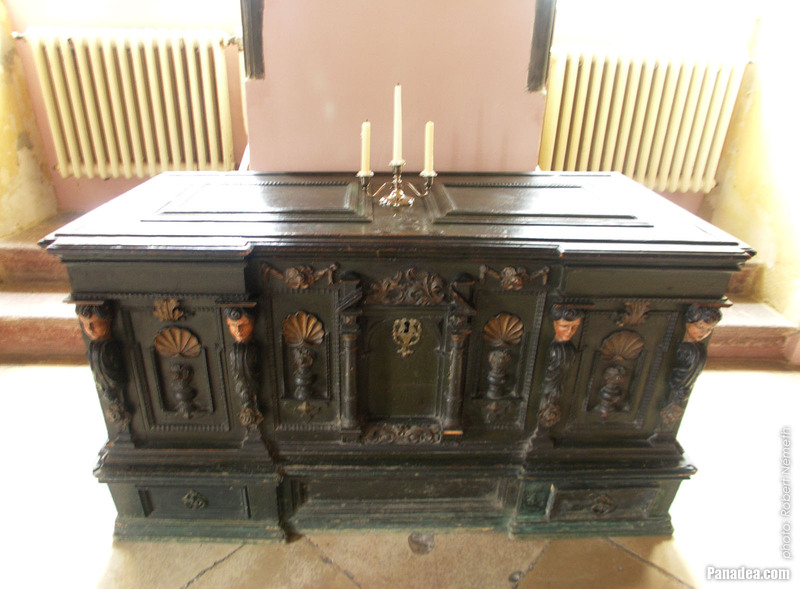 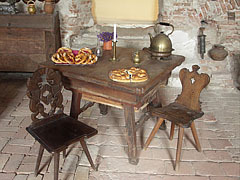 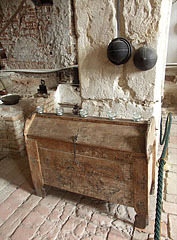 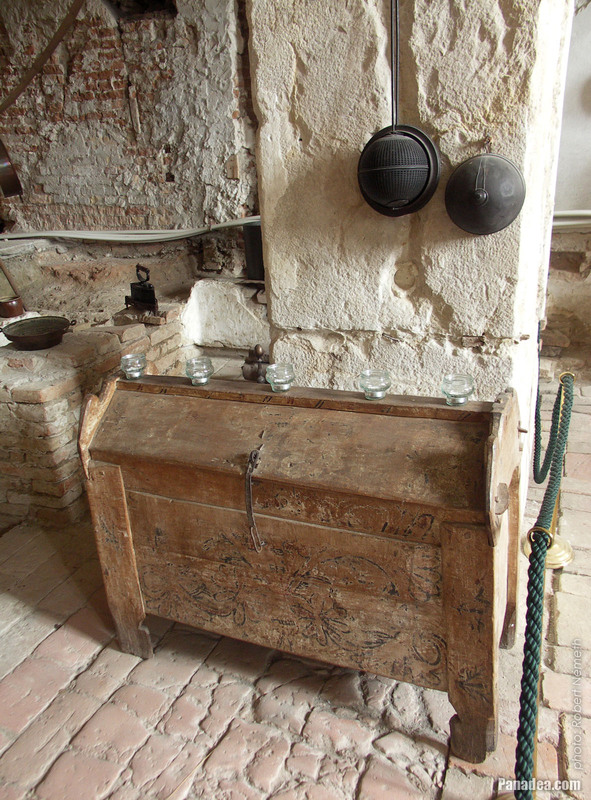 This is a benchwood timbered box with a lid, one of the oldest furniture types in the Carpathian Basin. 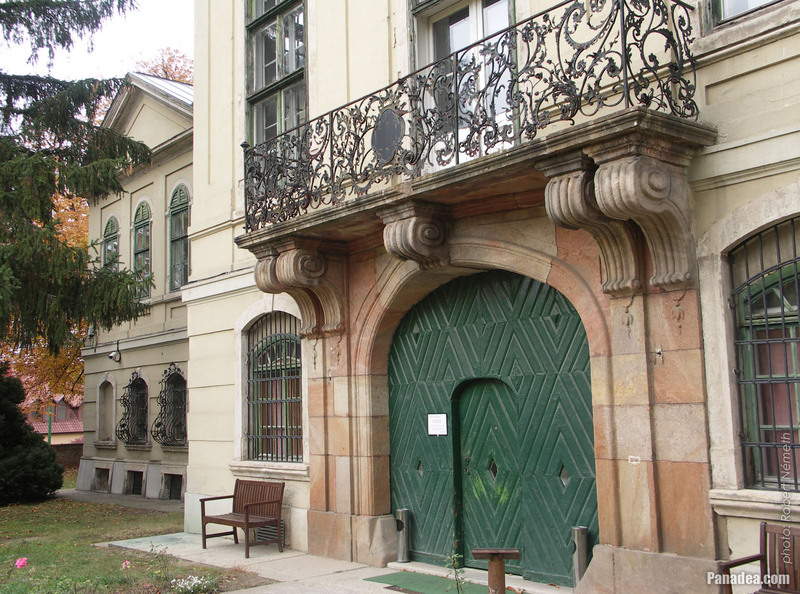 The building was functioned as the MÁV Hospital from the 1950s until 1997. 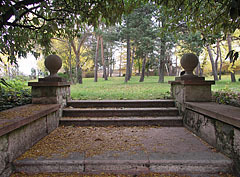 The garden was totally damaged when the mansion was used as a hospital from the 1950s. 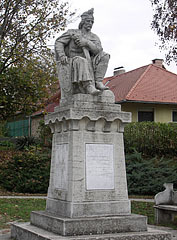 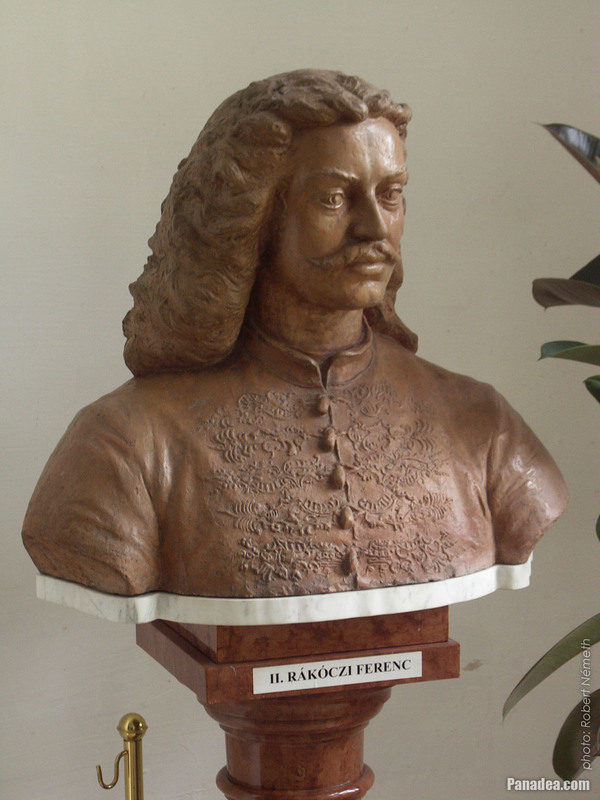 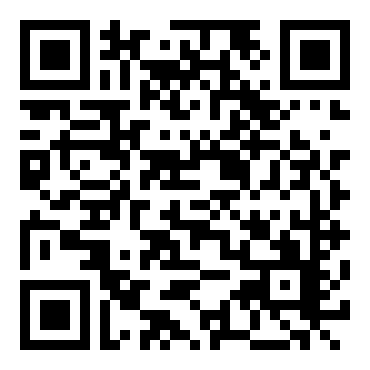 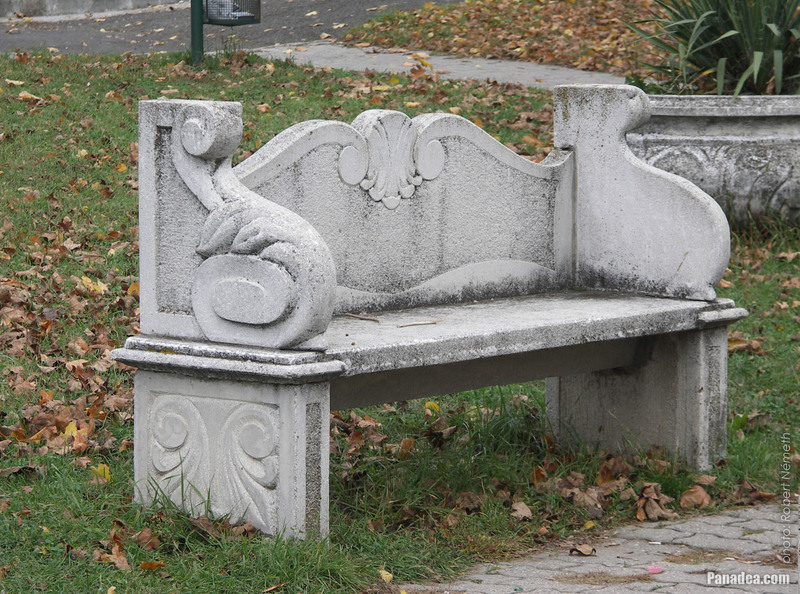 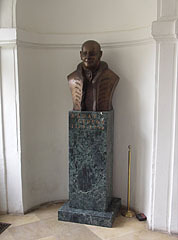 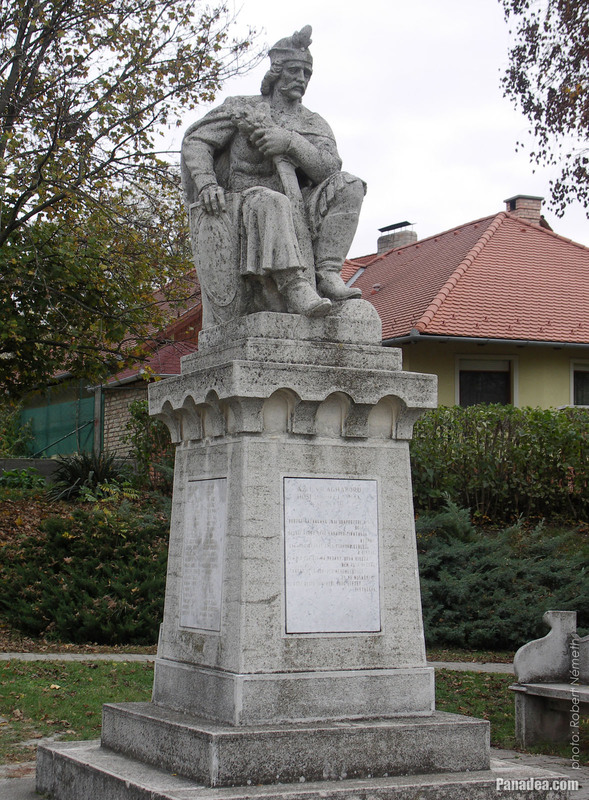 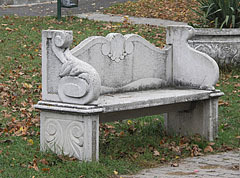 It was created based on the drawing of Ferenc Kazinczy Hungarian writer. 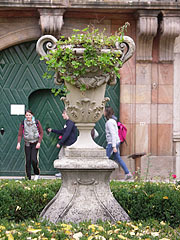 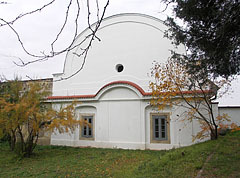 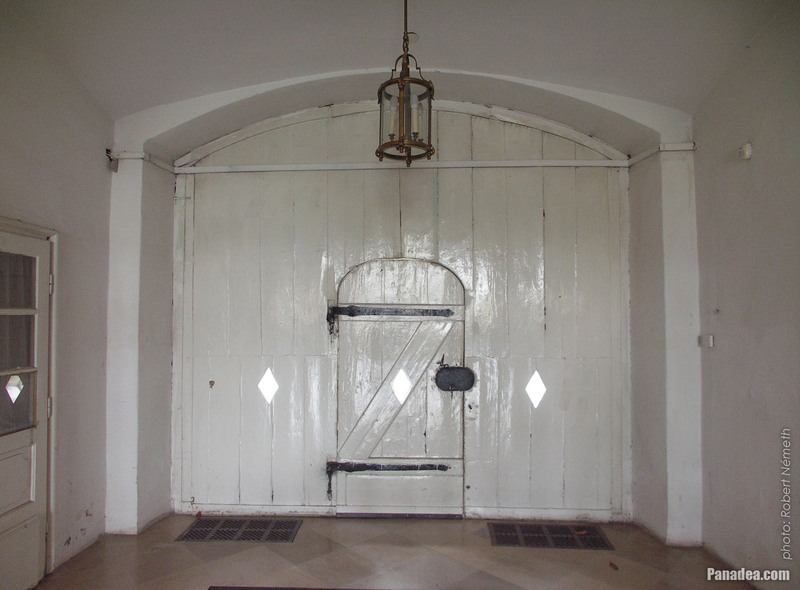 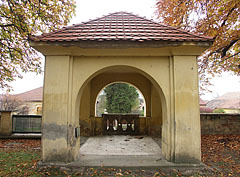 The Marble Stable belongs to the mansion, it was renovated in 2012. It is planned to be a visitor center and exhibition hall. 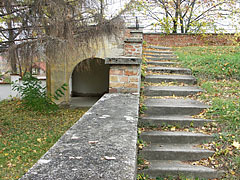 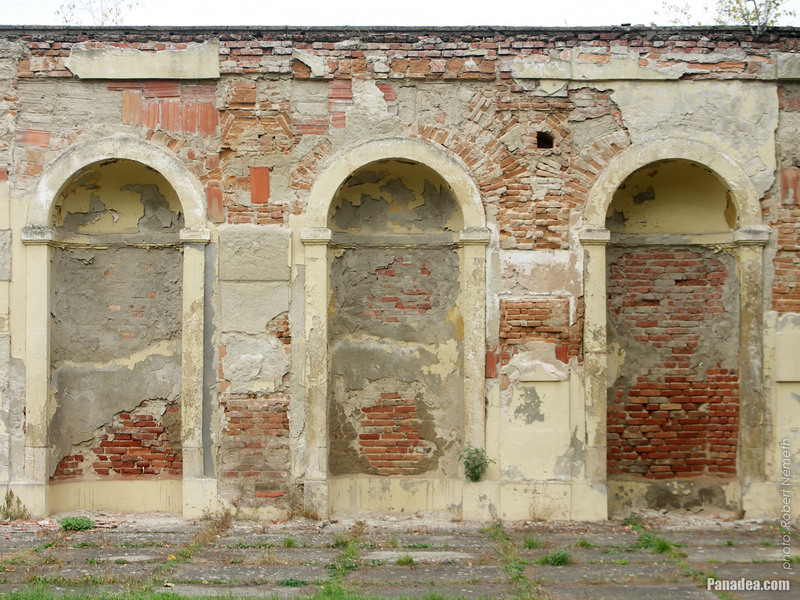 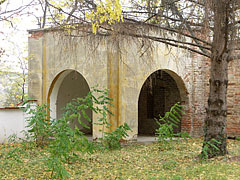 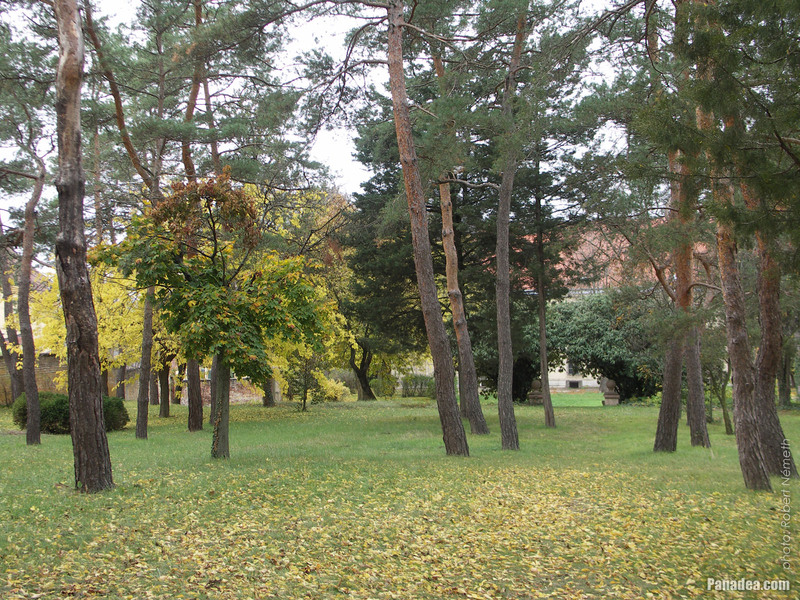 It was destroyed in the World War II and the hospital period. 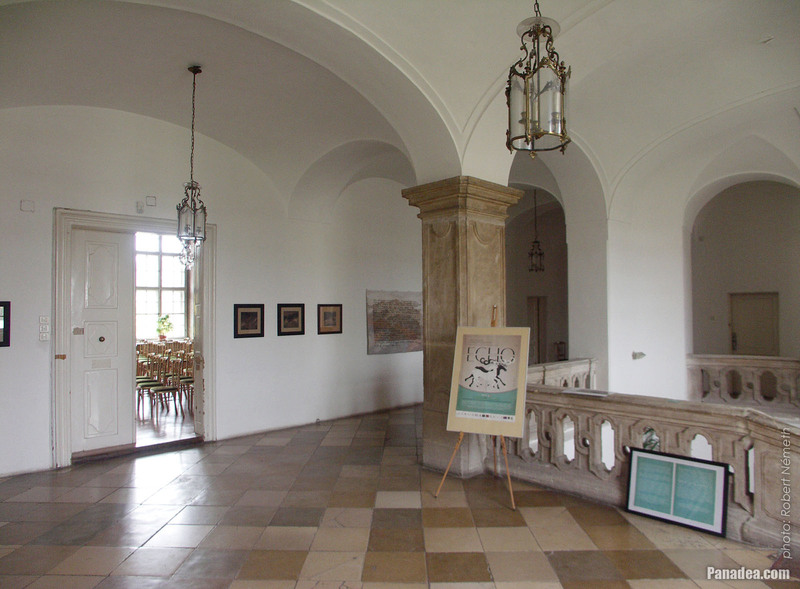 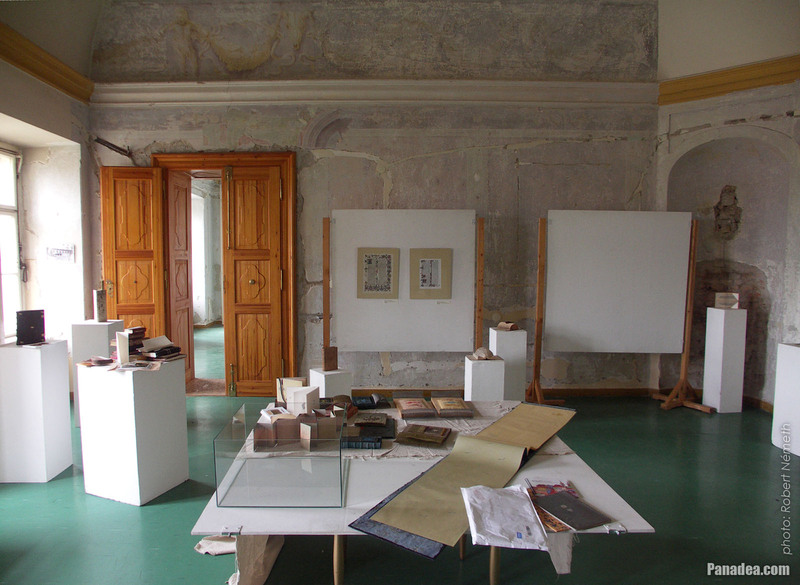 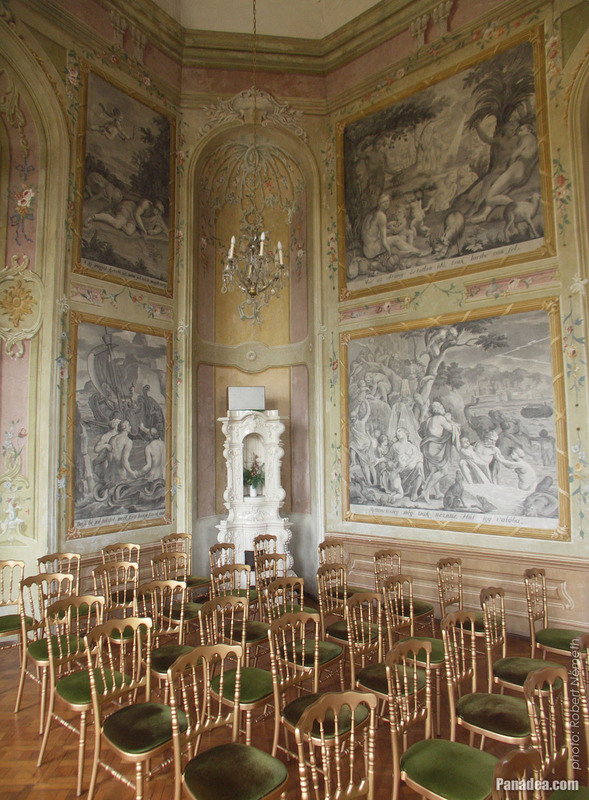 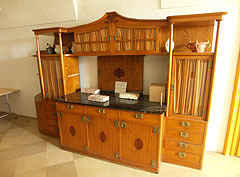 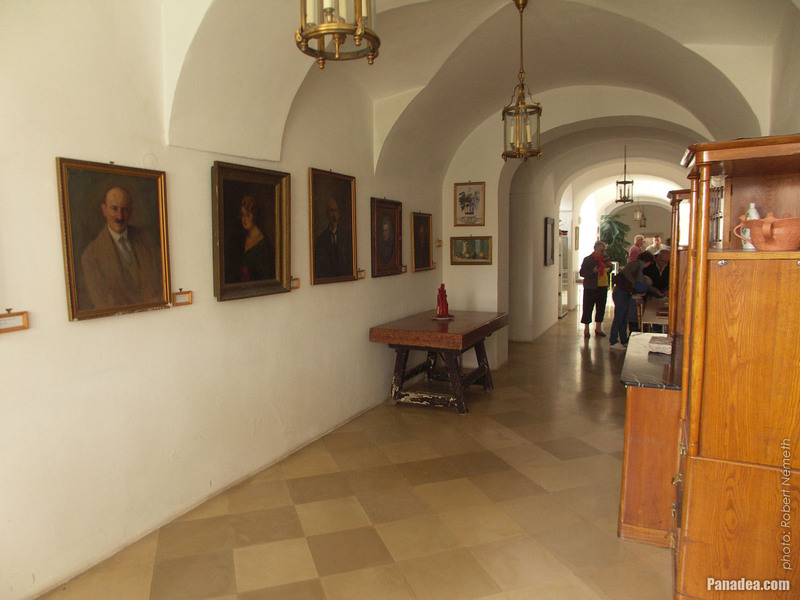 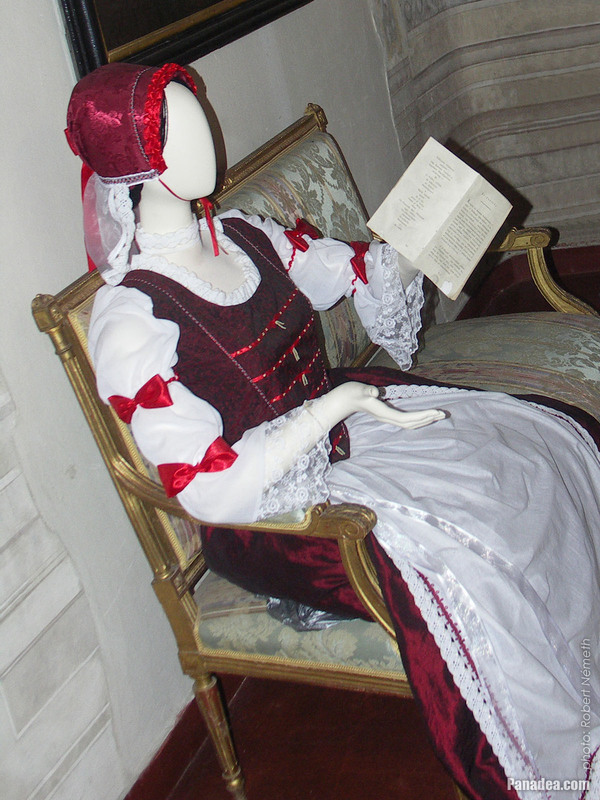 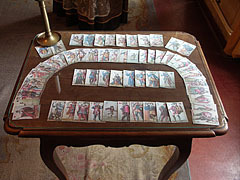 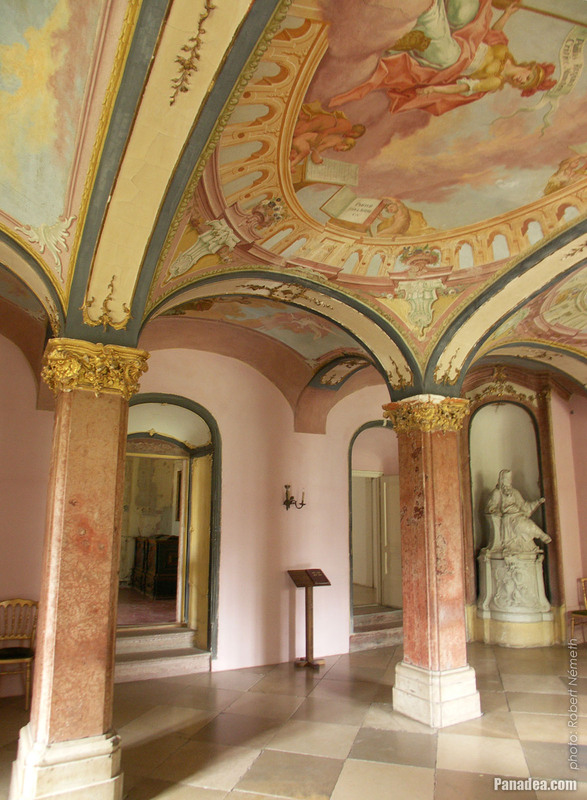 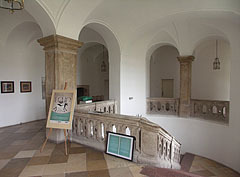 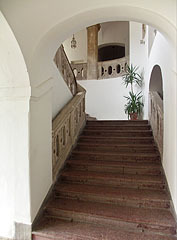 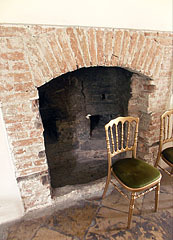 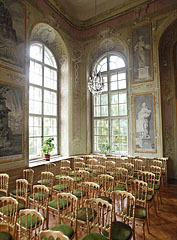 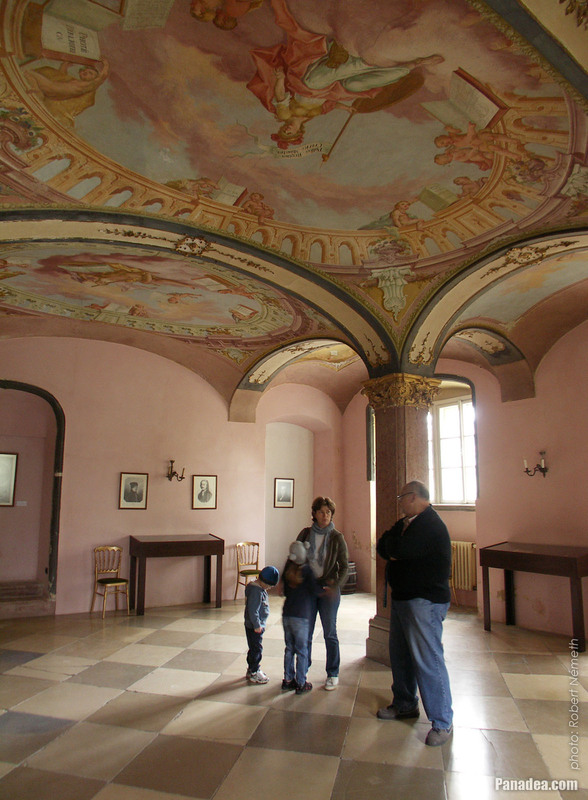 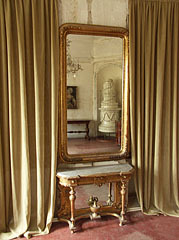 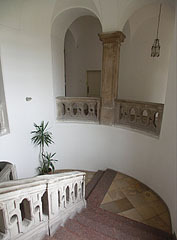 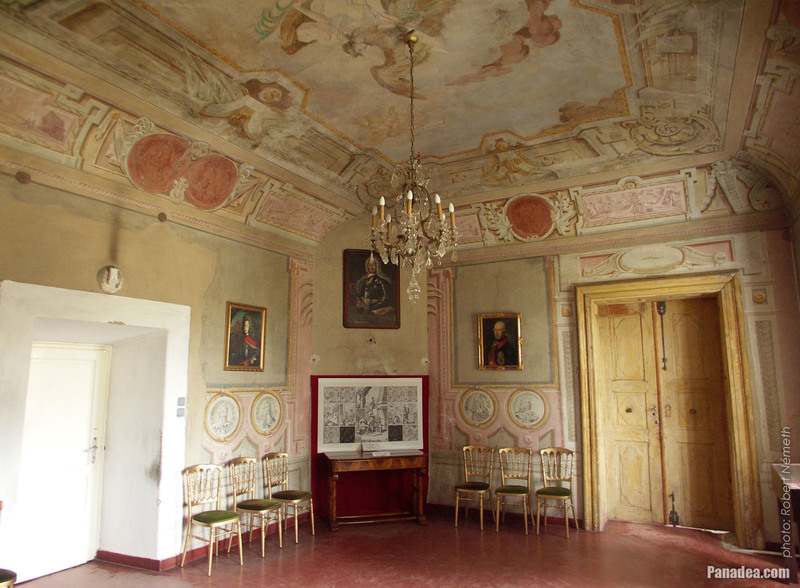 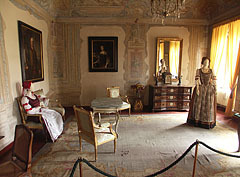 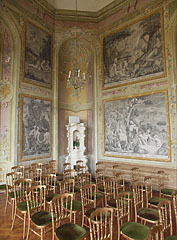 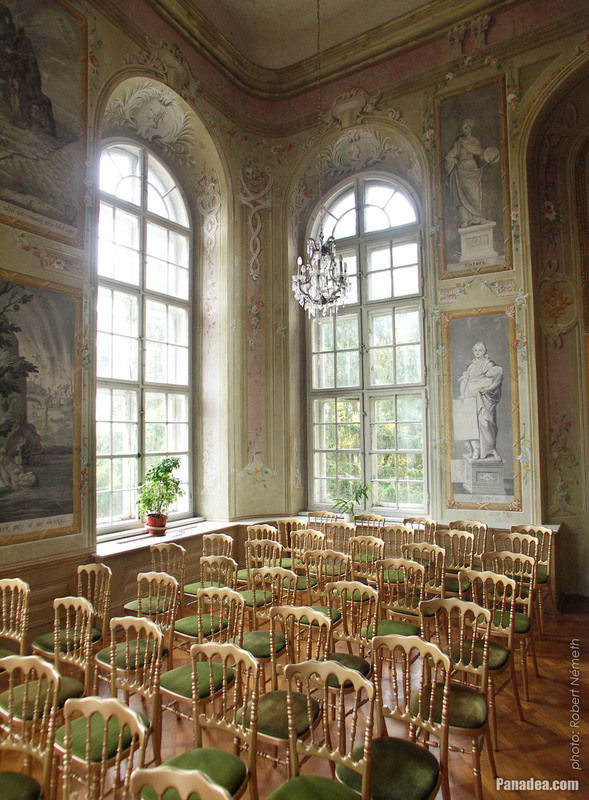 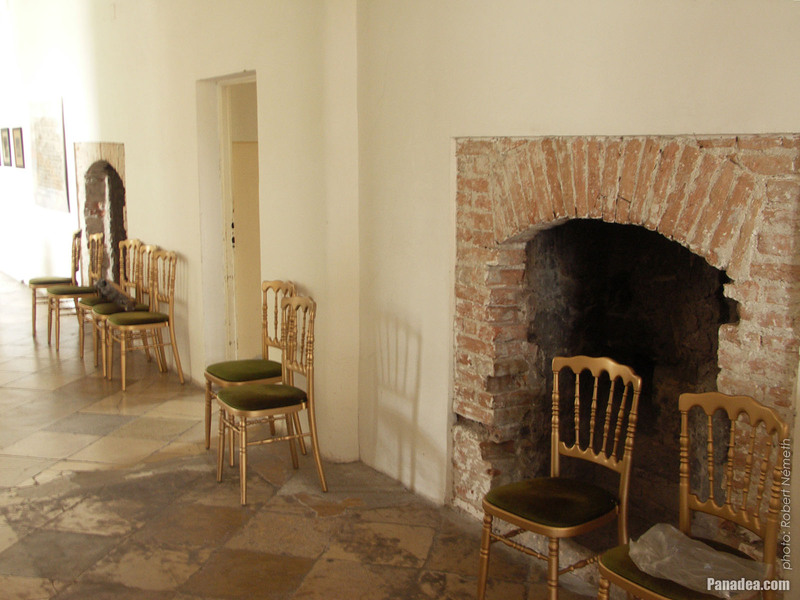 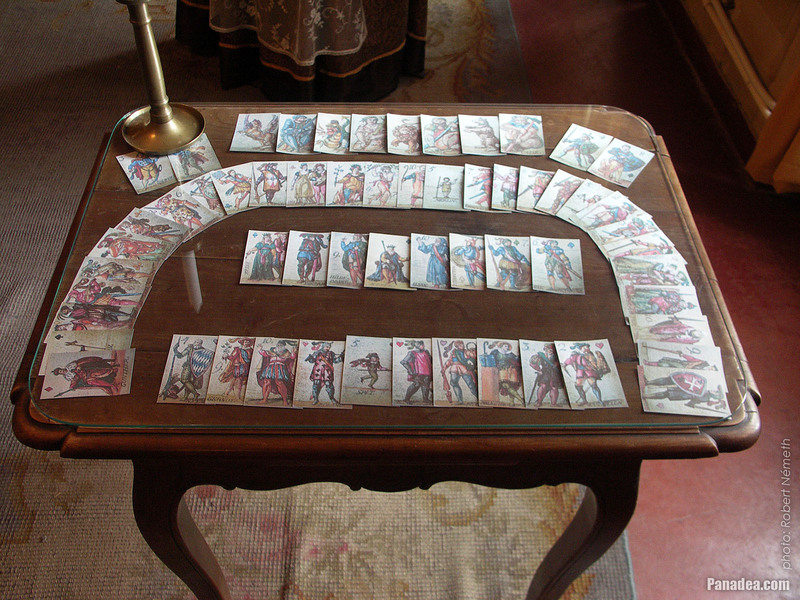 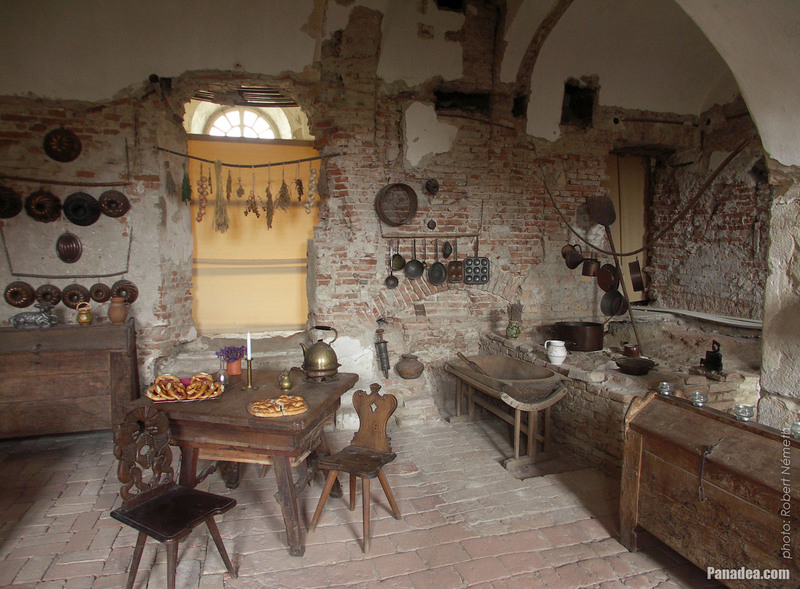 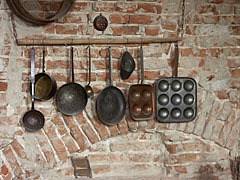 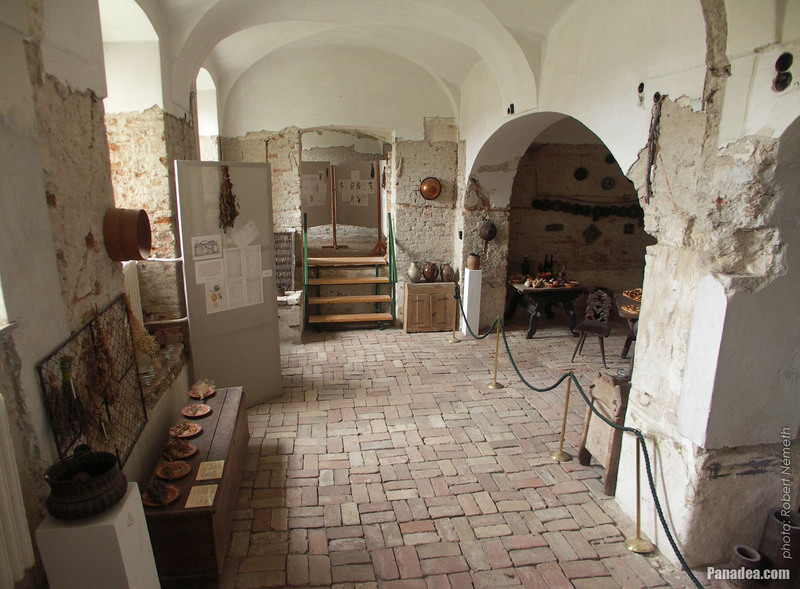 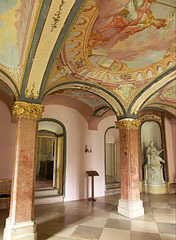 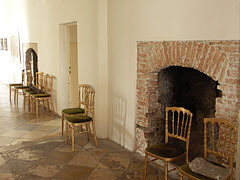 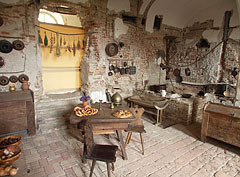 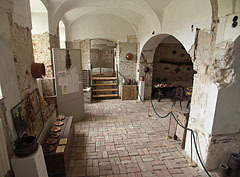 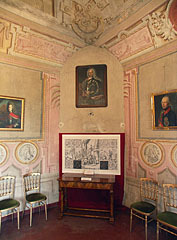 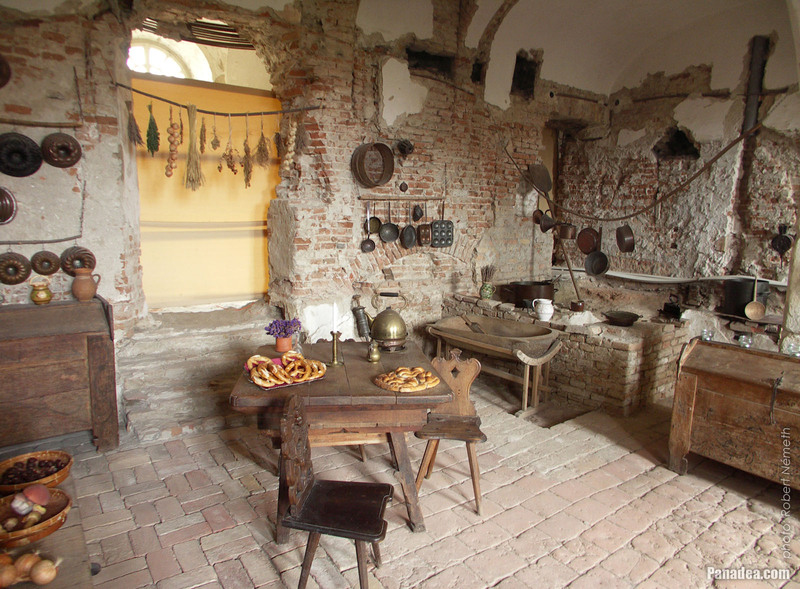 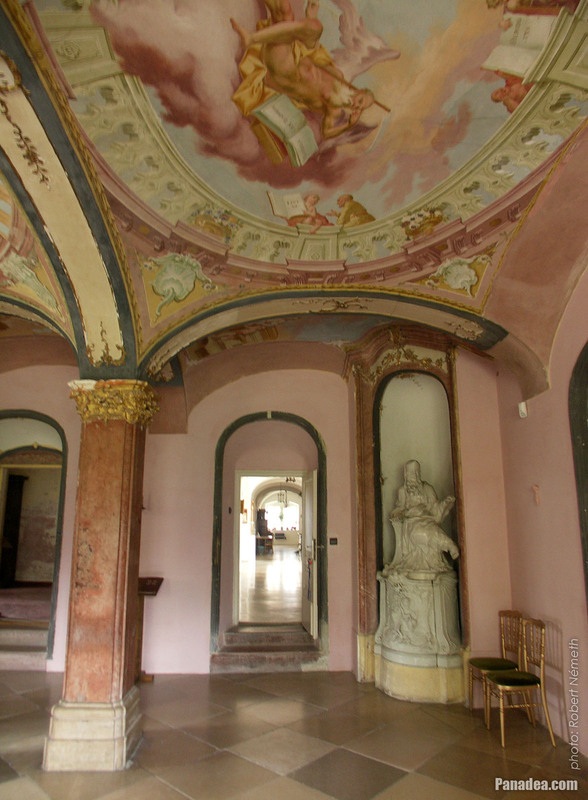 The Ceremonial Hall upstairs in the Ráday Mansion of Pécel was a representative state room or function hall. 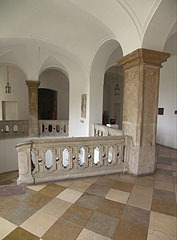 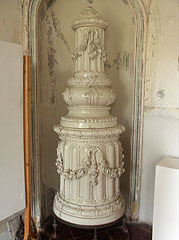 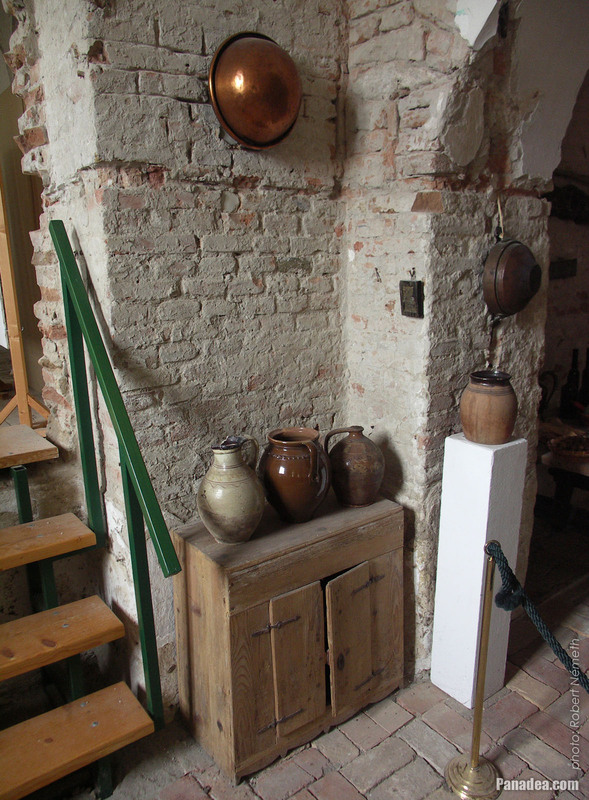 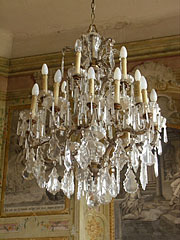 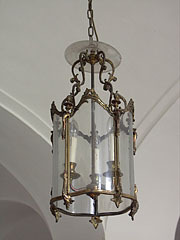 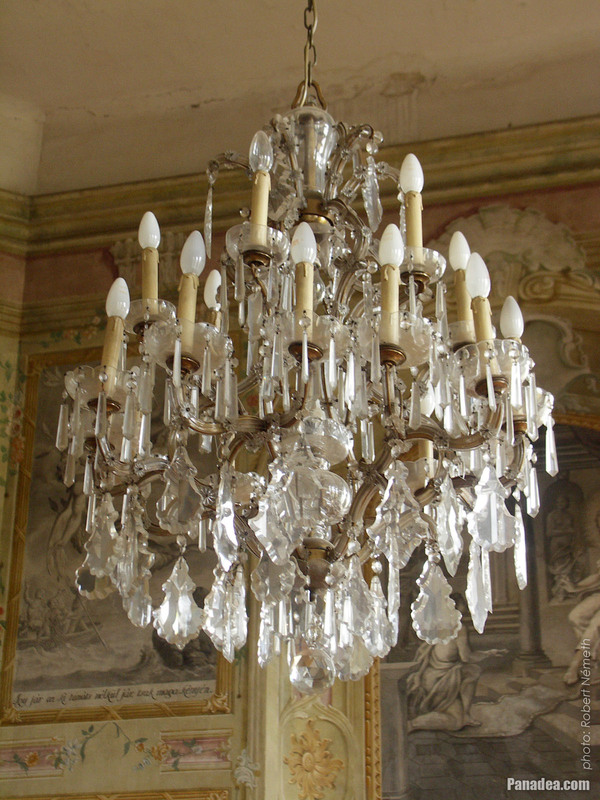 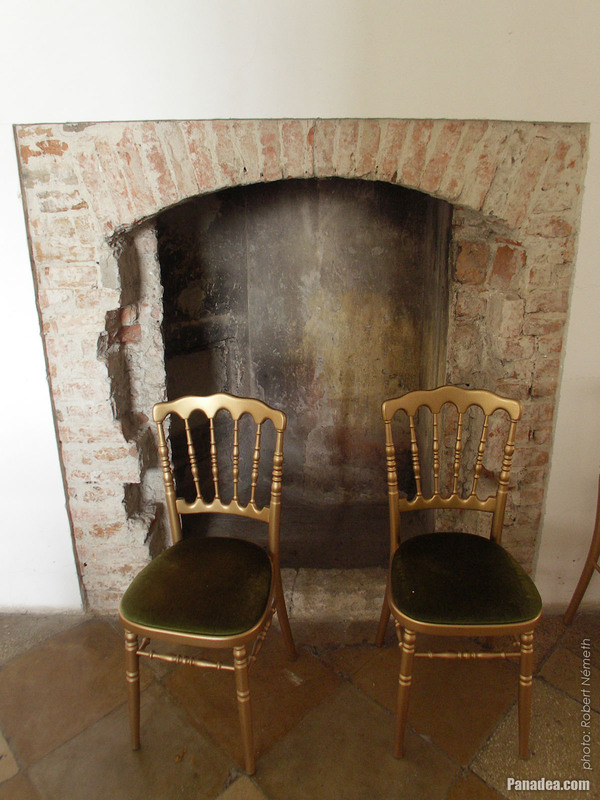 It was created during the alteration works between 1755-1766. 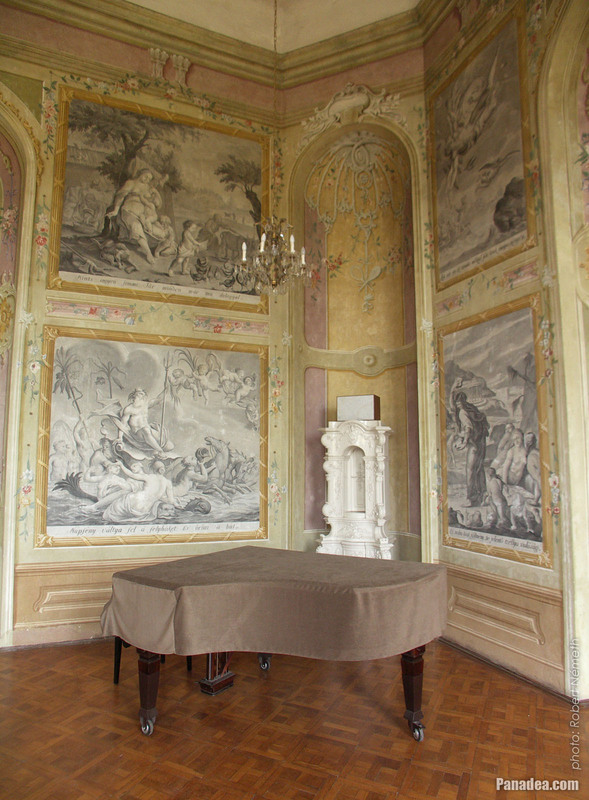 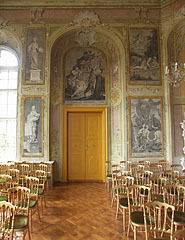 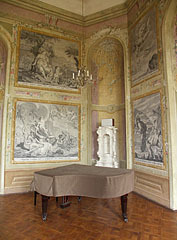 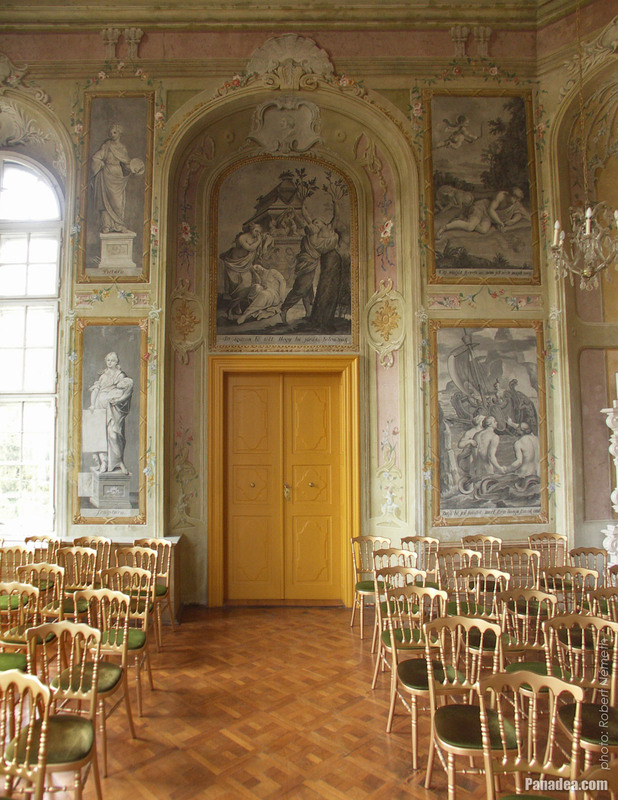 The Ceremonail Hall also known as the "Dining Palace", its walls are covered with unique monochromatic, single-colored murals which almost look like drawings. 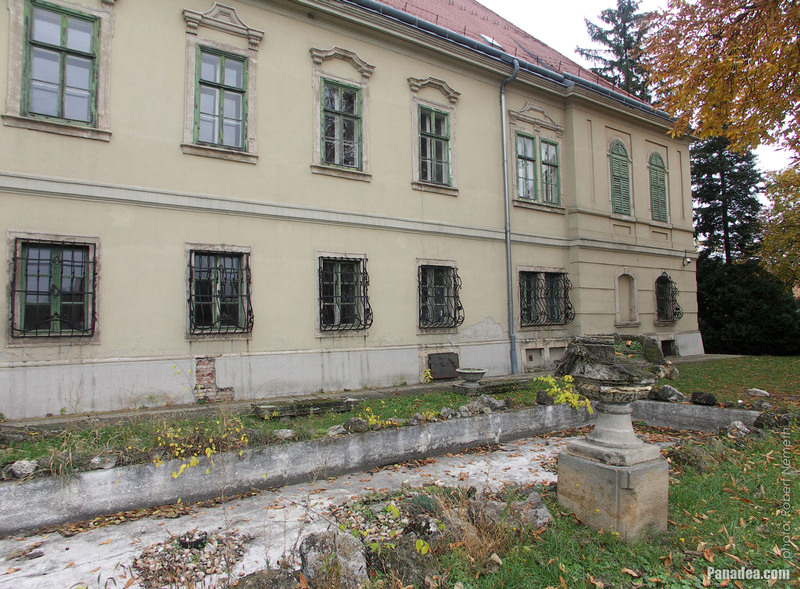 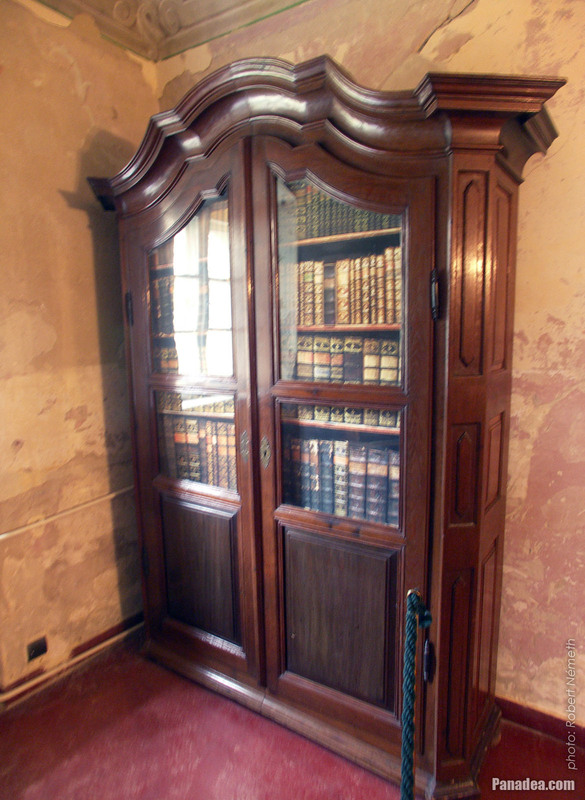 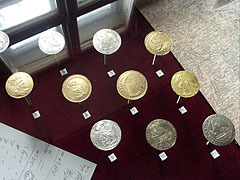 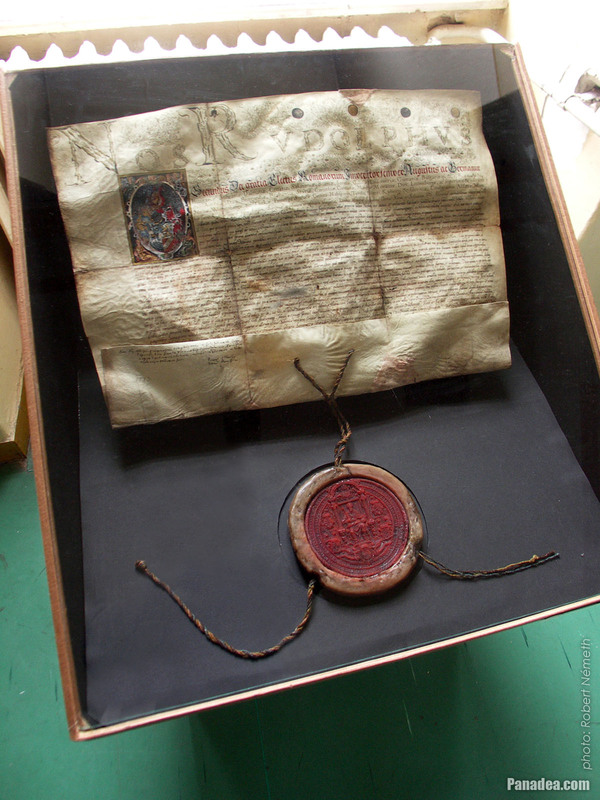 These were requested by the former owner of the mansion, the educated Gedeon Ráday. 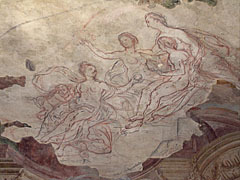 The pictures were selected from his favorite illustrated books: the "Metamorphoses" (English: "Books of Transformations") and the "Temple des muses" (French, in English it means "Temple of the muses") of Publius Ovidius Naso antique Roman poet (also known as Ovid). 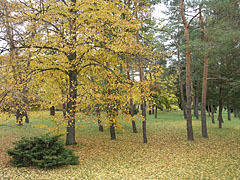 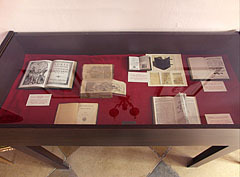 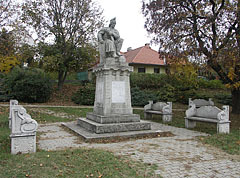 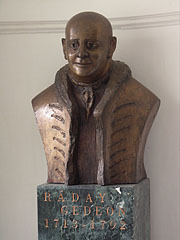 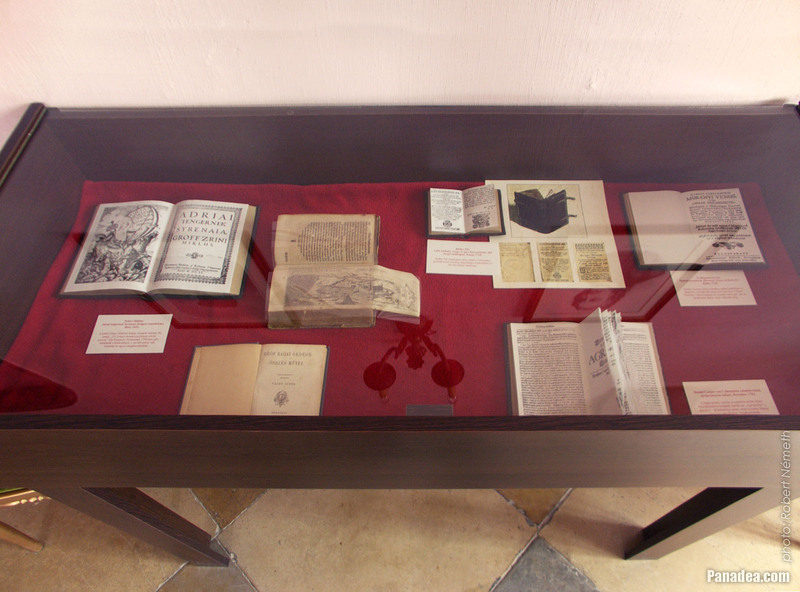 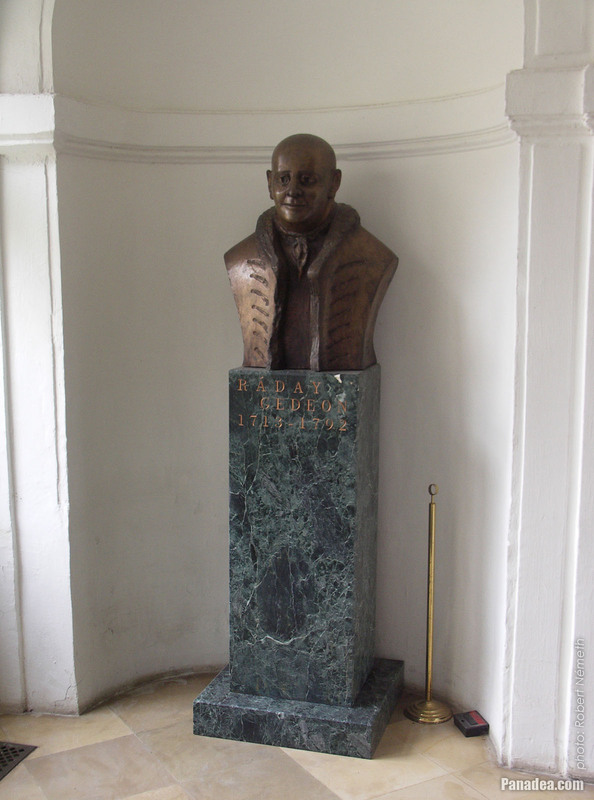 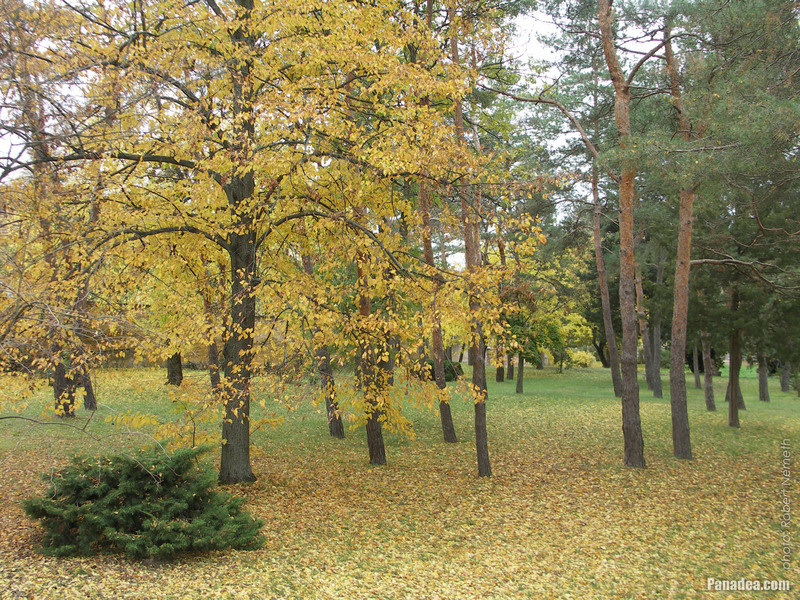 The moral messages and hexametric verses under the pictures were written by Gedeon Ráday himself. 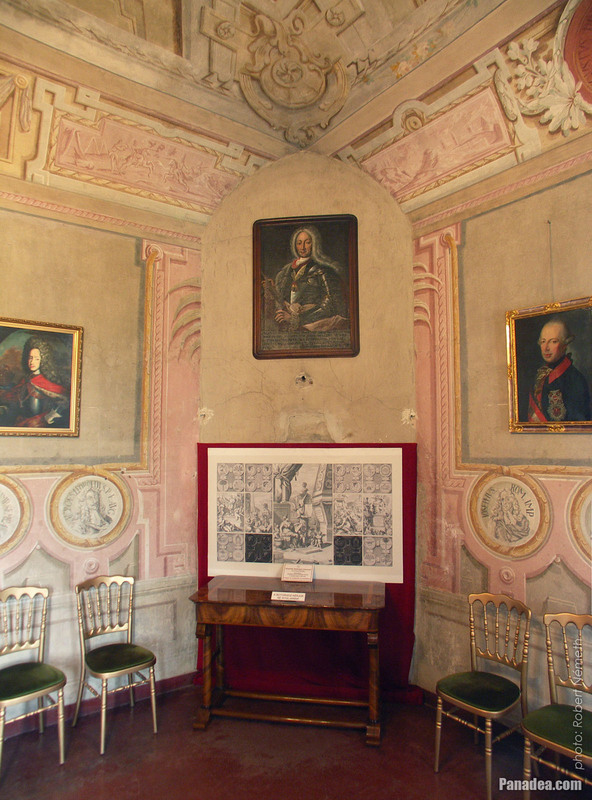 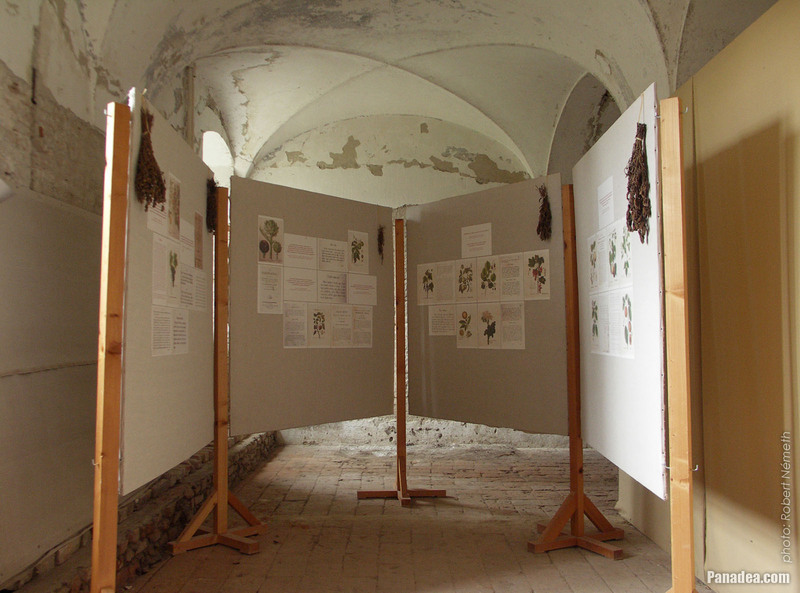 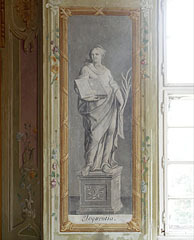 The original pictures in the books were copperplate engravings and created by Bernard Picart and Philipp von Gunst, and the murals were painted on the walls based on them in 1766. 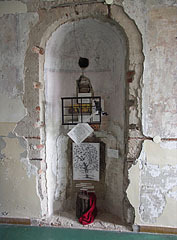 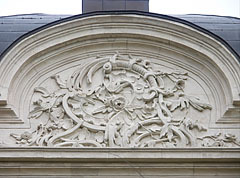 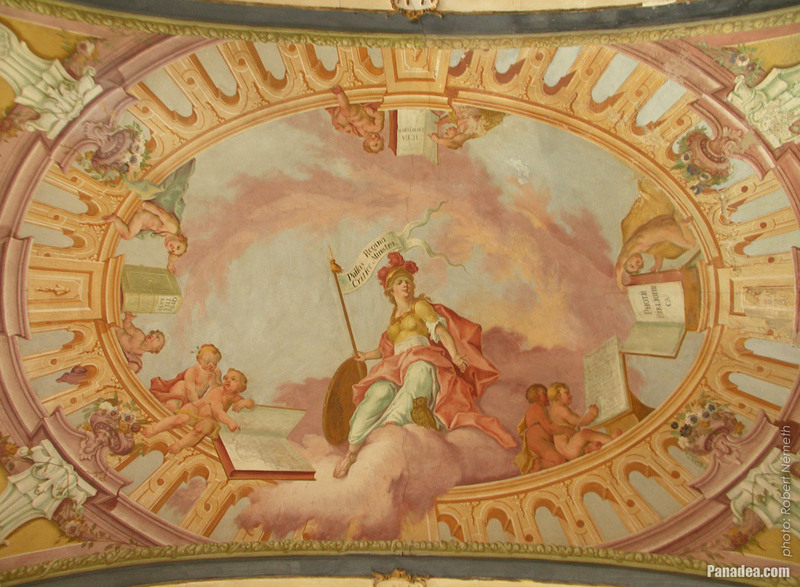 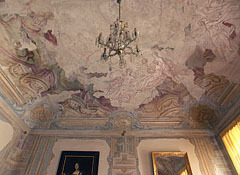 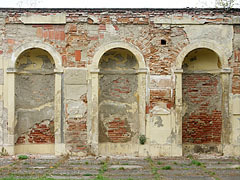 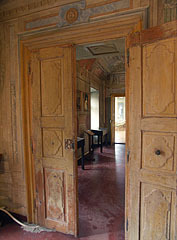 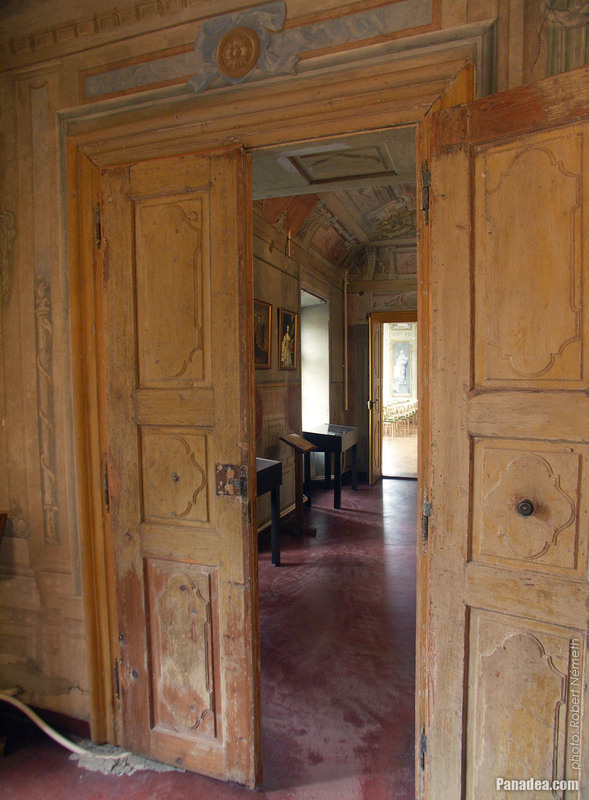 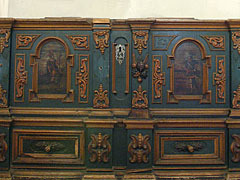 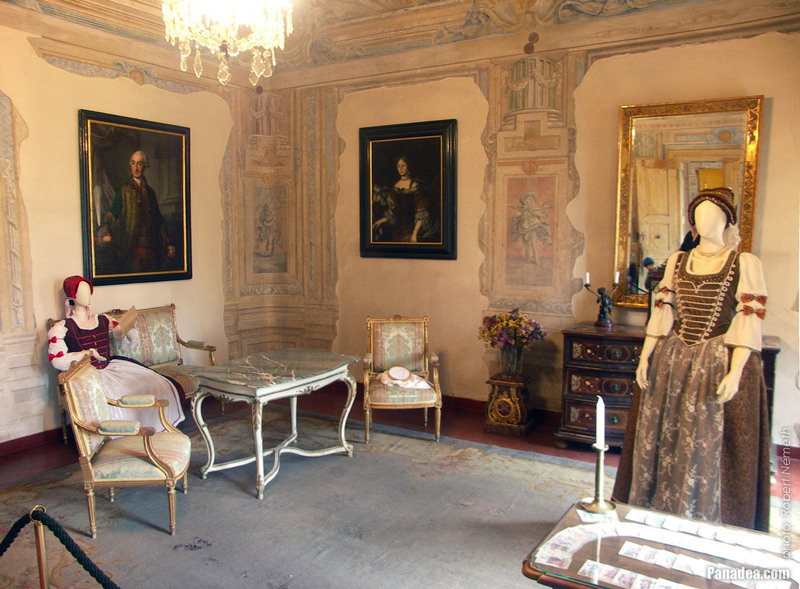 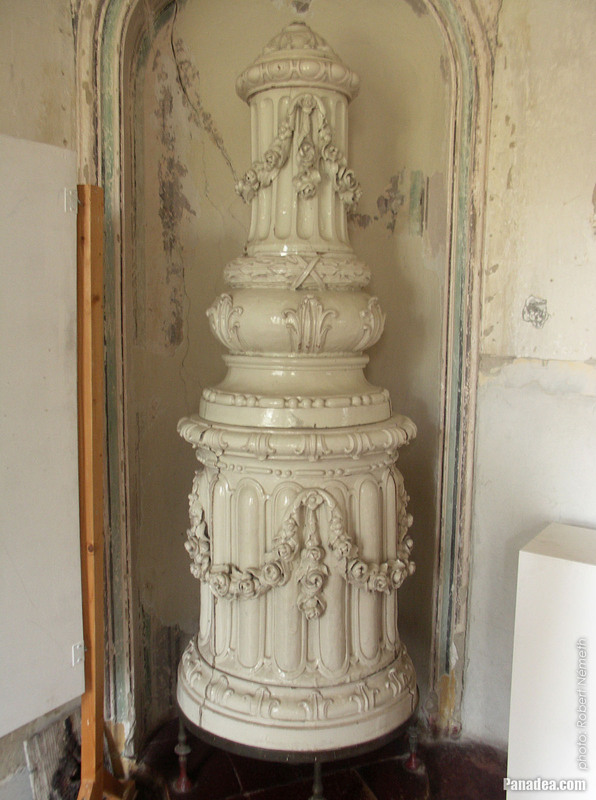 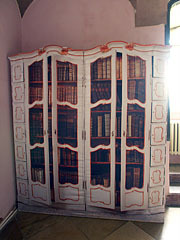 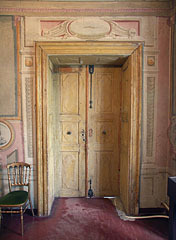 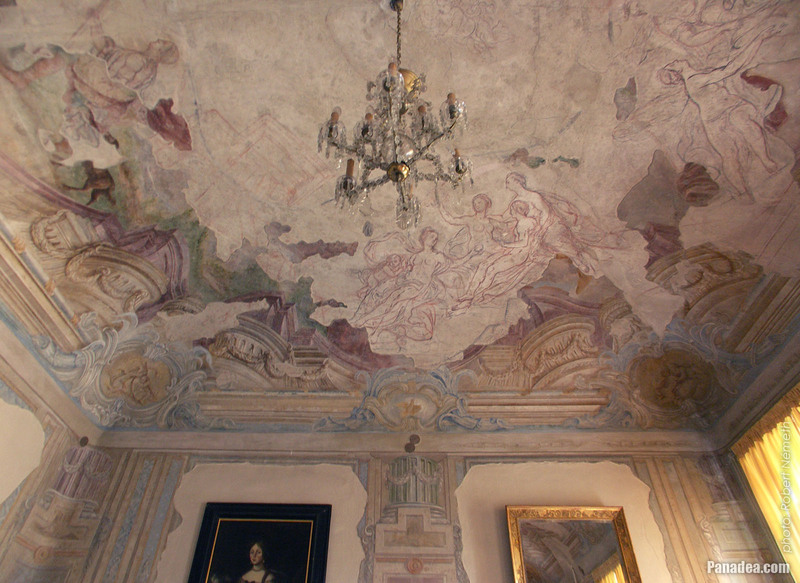 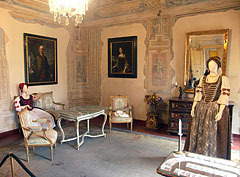 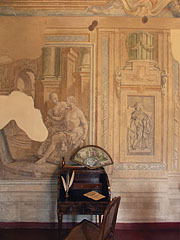 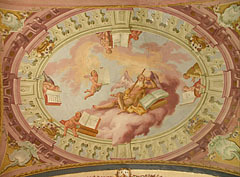 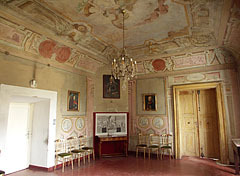 The monchrome pictures were created by fresco technique (in Italian "affresco", powdered pigment is applied on wet lime plaster), while the colorful flower garland ornamentation was painted by secco technique (wet paint is applied on dry wall). 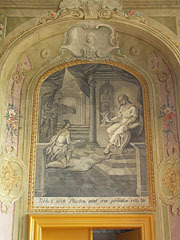 The painter is unknown in both cases. 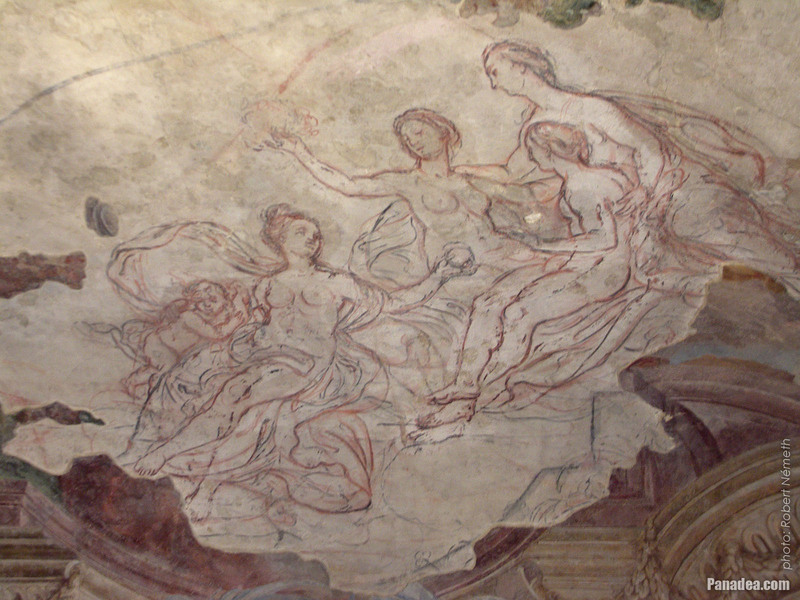 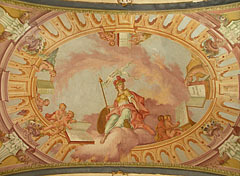 During the devastating fire of 1825 the dome of the mansion was collapsed, and because the Ceremonial Hall was under it, the mural of Phaeton on the ceiling was destroyed and has never been restored. 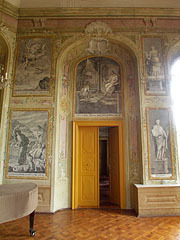 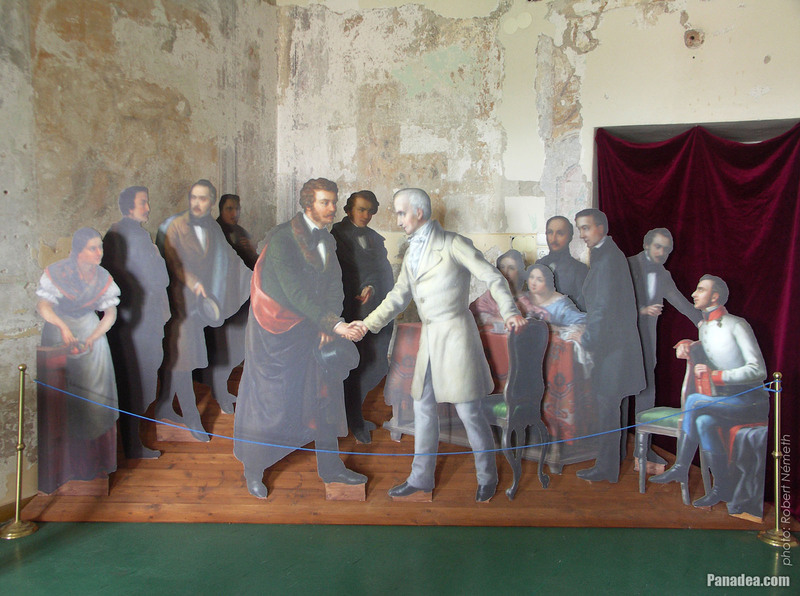 The models of the wall paintings were created by copper engraving. 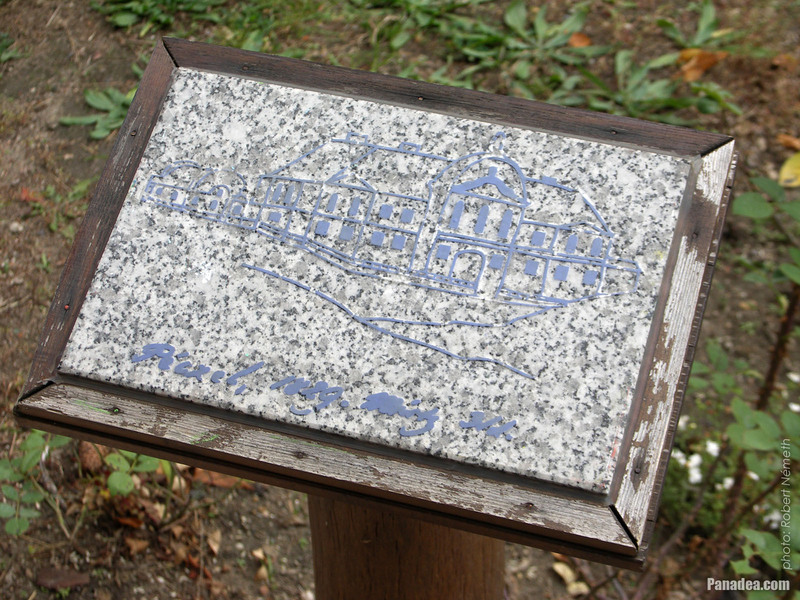 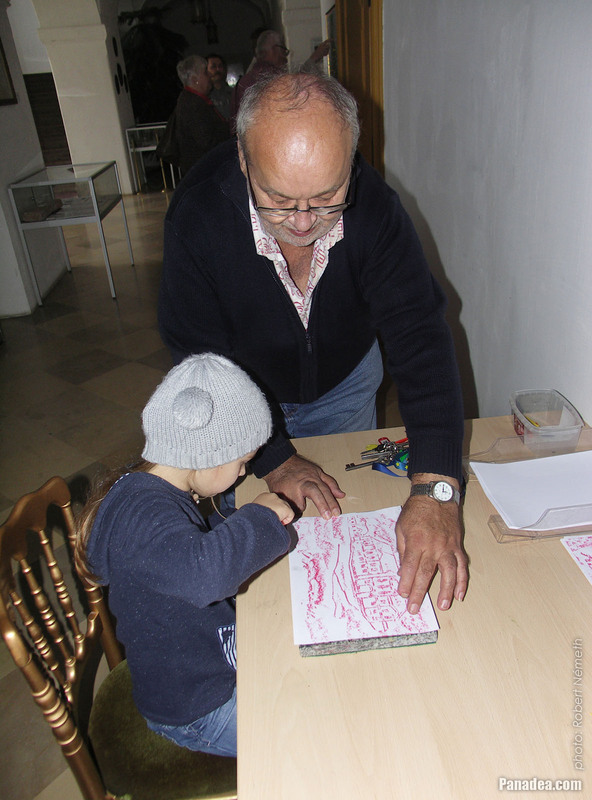 This technique is similar to the copper etching, both are copperplate-based intaglio (relief) printing processes. 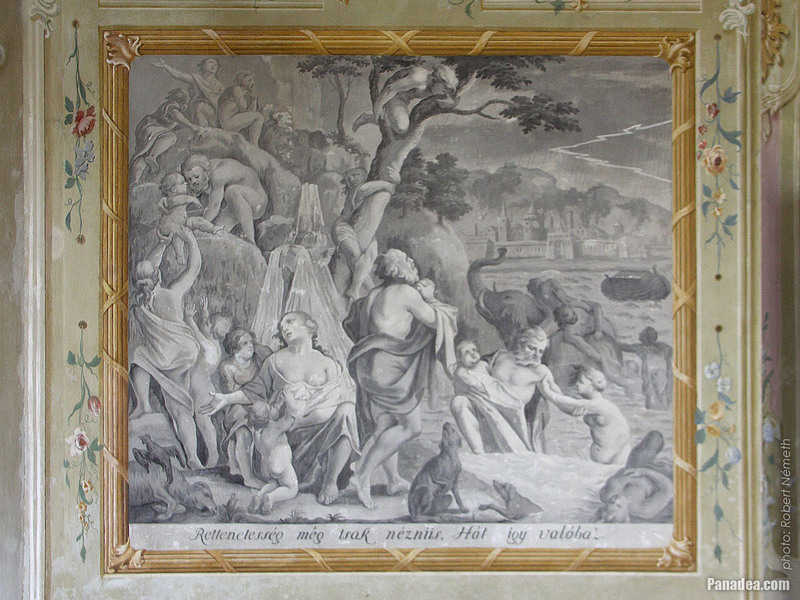 The difference lies in that whereas in the case of copperplate etching the lines are etched out with acid, the copper engraving uses physical force to do this. 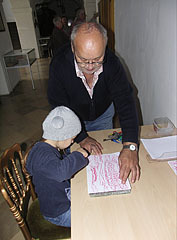 And this is exactly why it is faster and easier to make a copperplate engraving than the etching.